Well, hello! It’s been awhile, huh? 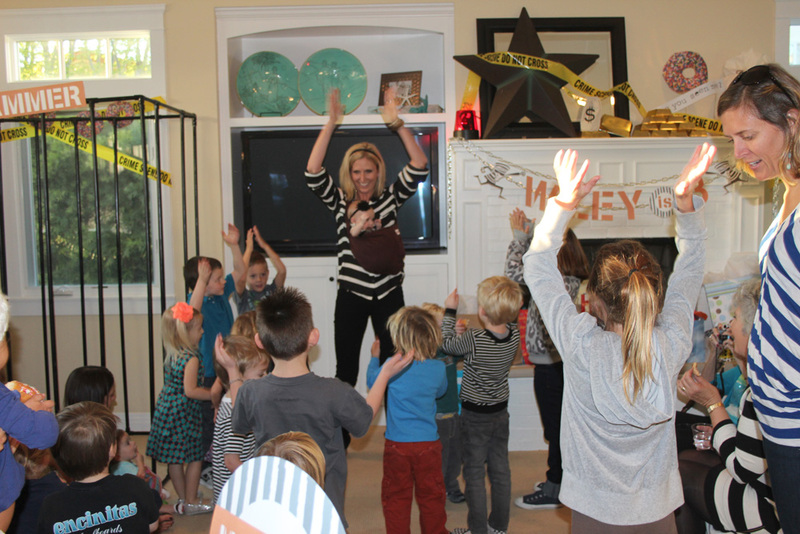 I still have SO many other parties to blog about from this fall… a cute cowboy shindig, a girly dino party, and a few other get-togethers but I guess this whole “3 kid” thing takes a little more time than I thought! Ha! 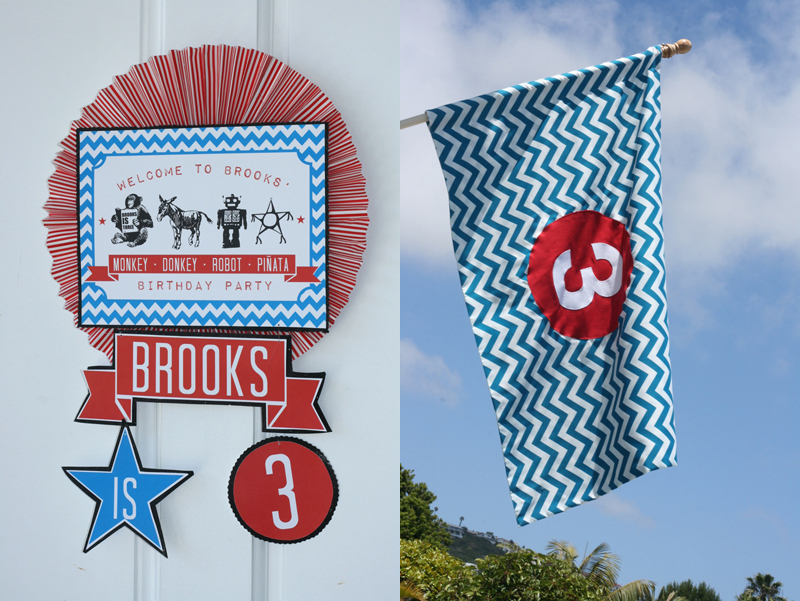 Anyway… today I present to you my son’s 3rd birthday party! The theme? 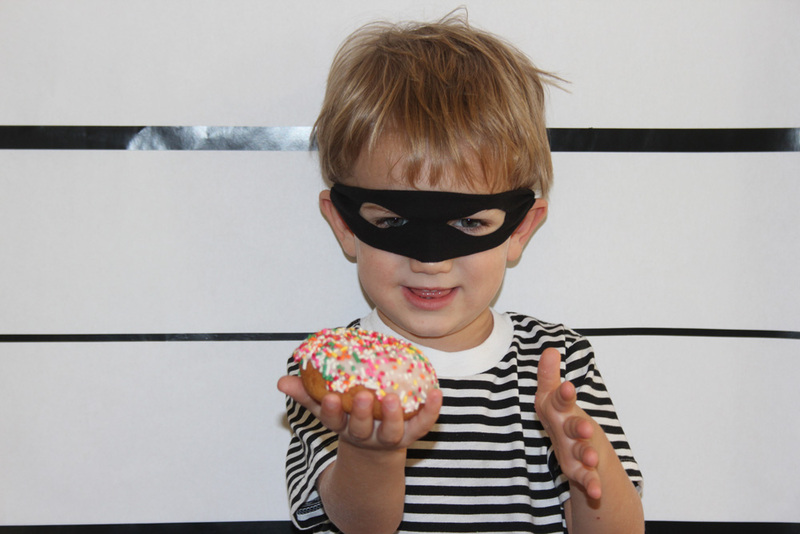 Donut Thief. 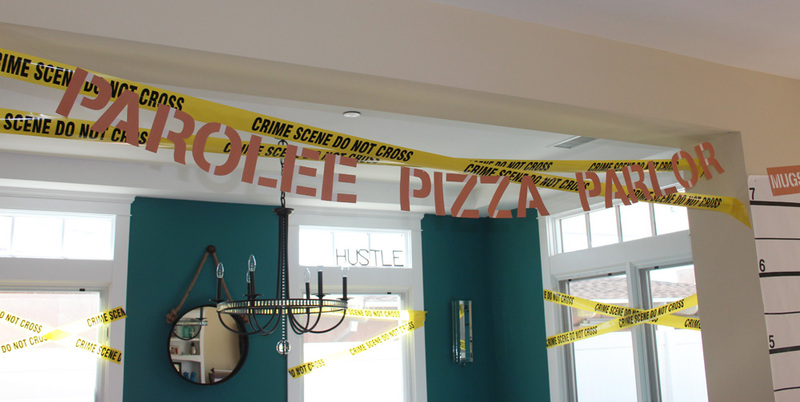 I was actually really excited about this theme since I saw a cool graphic for a thief at a restaurant in Boston about 4 years ago and I knew it would be perfect for the party. 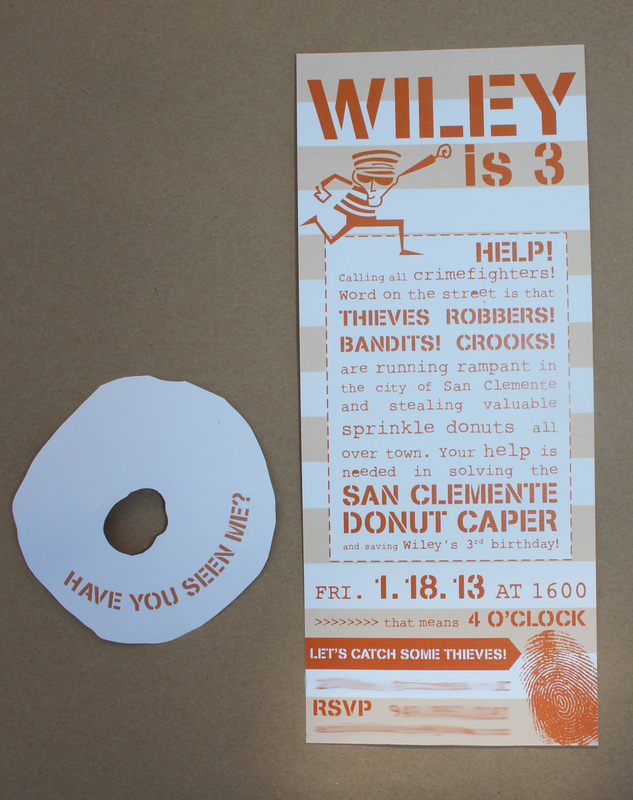 Along with the invite, we sent a donut that said “Have you seen me?” on the back and a robber mask. 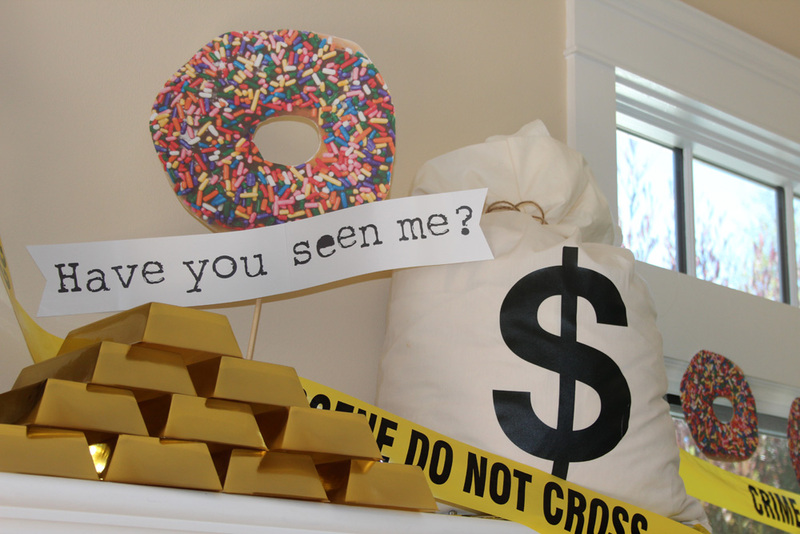 The goal of the party was to solve the mysterious caper of the disappearing donuts. It was a strange theme to work with but ended up being really fun to crank on. 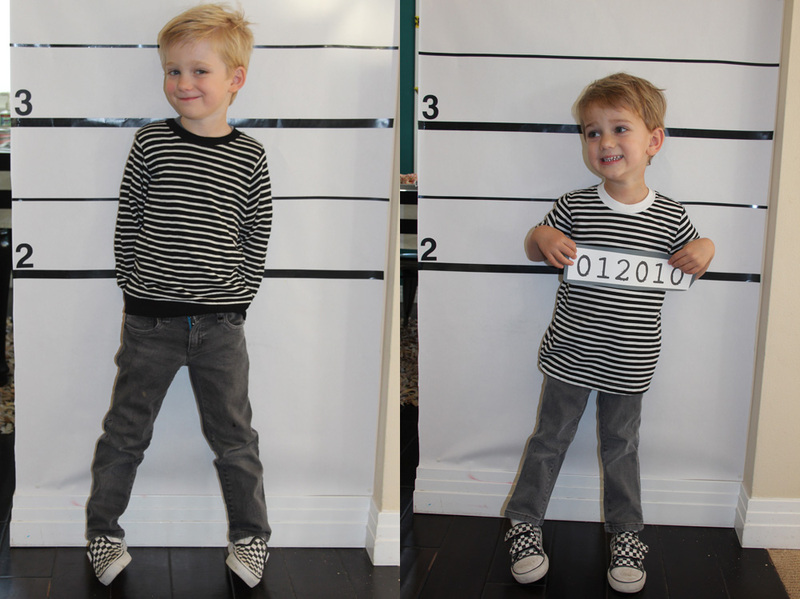 I should mention that both of my boys are obsessed with thieves. The reason? My sister had them at the beach when I was in the hospital having my daughter and her car was broken into. A policeman came and met them at the car and I think that they were entralled. From that point on, they cannot stop talking about thieves! Obsessed, I tell you! And you know me and food… Not my strong suit. 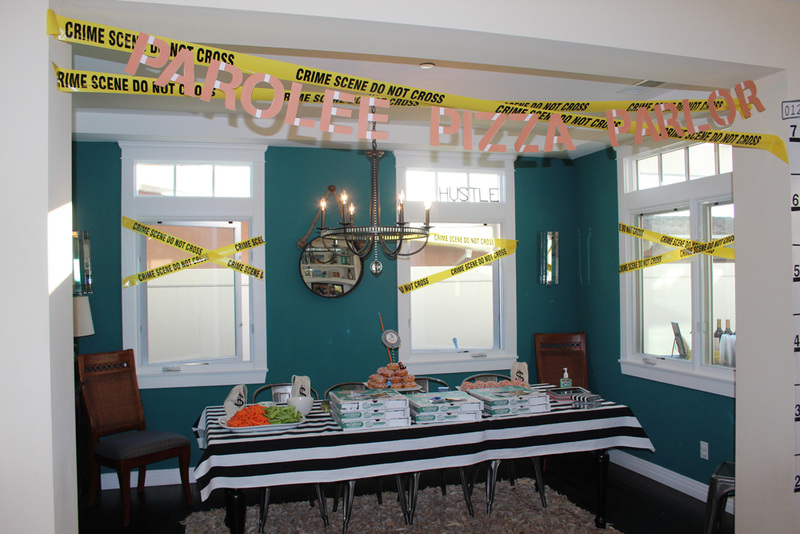 For the kids, we had a “Parolee Pizza Parlor” and veggies. 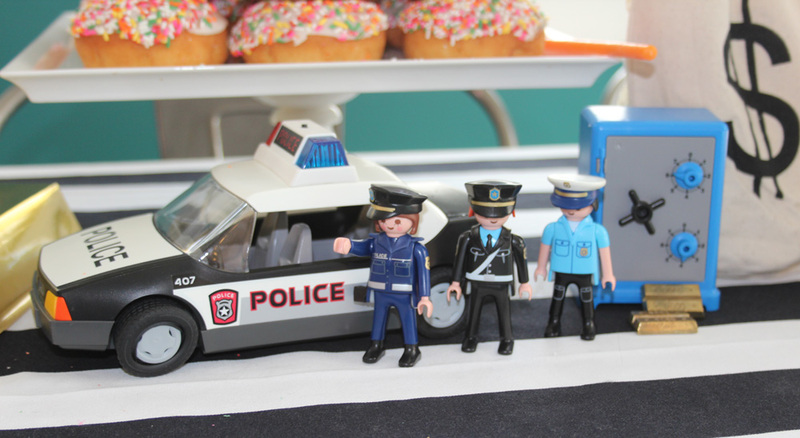 The police guarded the table quite nicely for us. 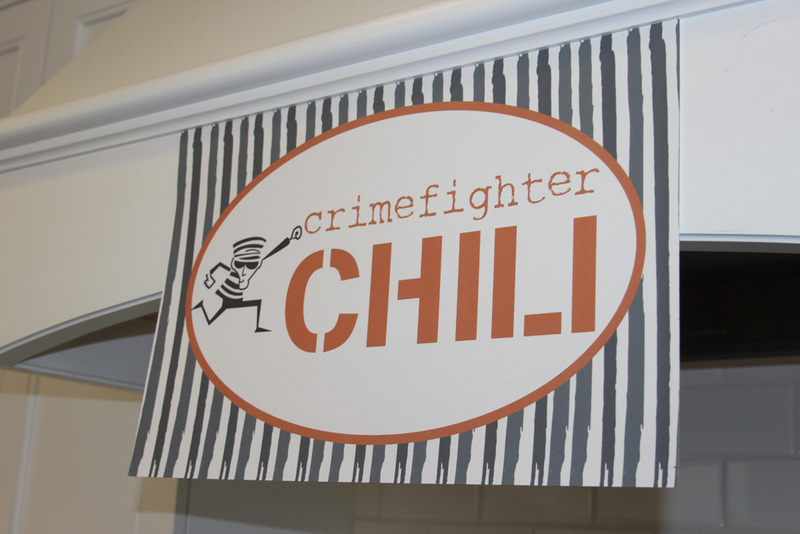 For the adults, we made “Crimefighter Chili” And since all he wanted were donuts on his birthday, that’s all he got! 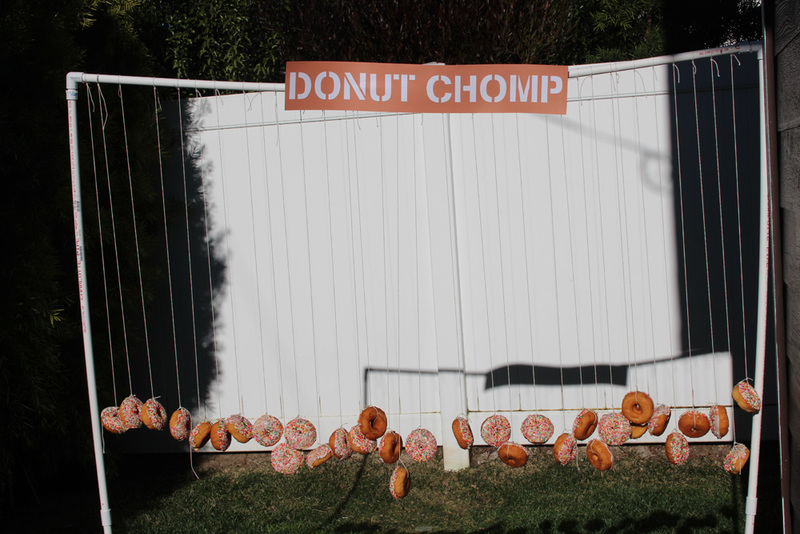 100 donuts to be exact! 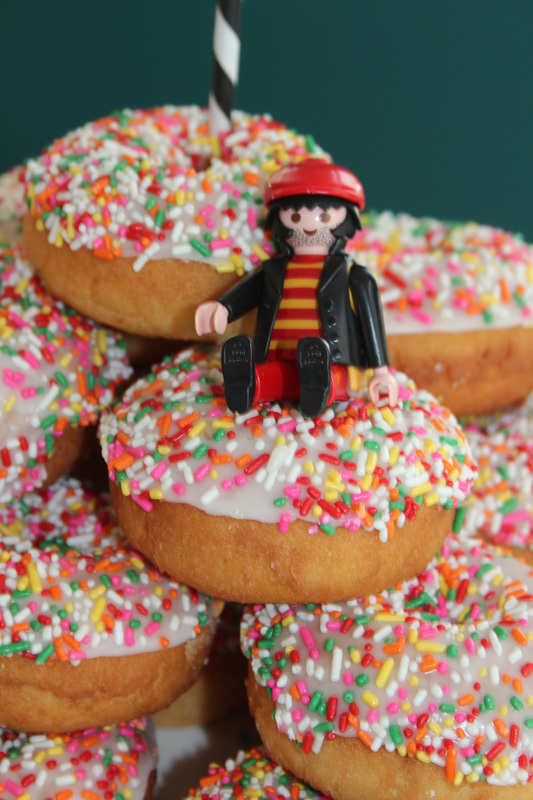 And ALL of them were eaten! That should tell you the level of craziness at the party. 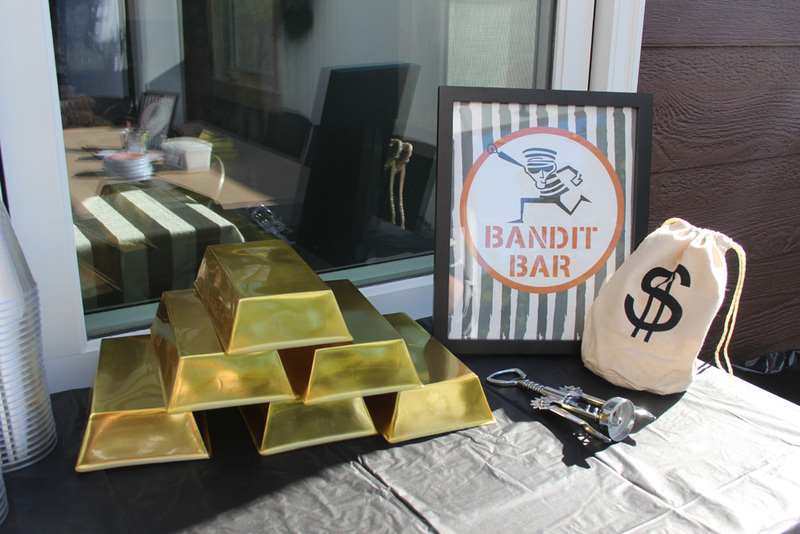 The “Bandit Bar” was fully stocked of course! (I think the adults may have had more fun than the kiddos!) 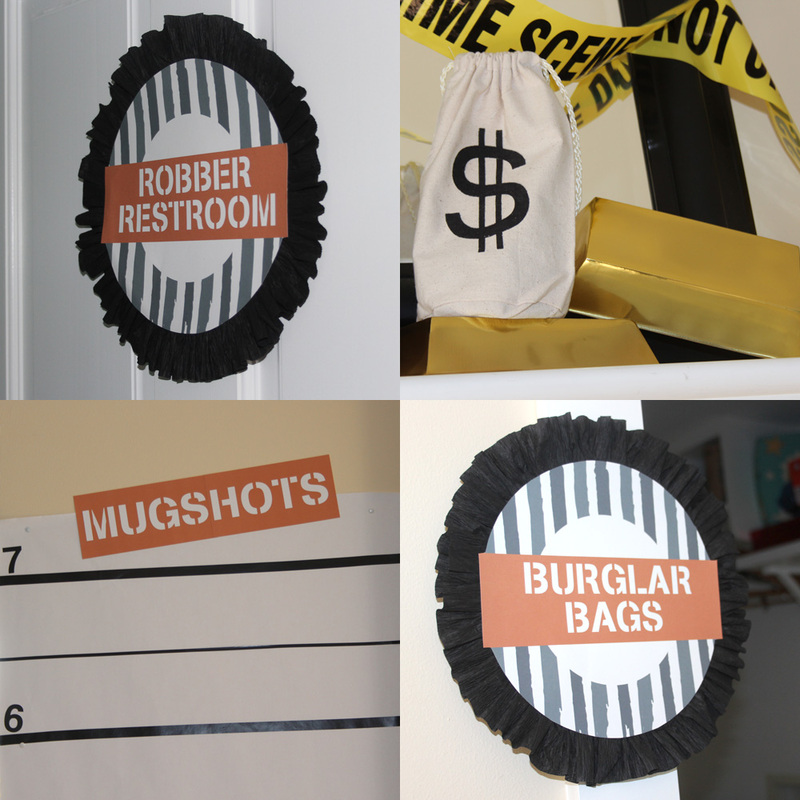 And as favors we gave handcuffs and robber masks that they could take right away to play with. 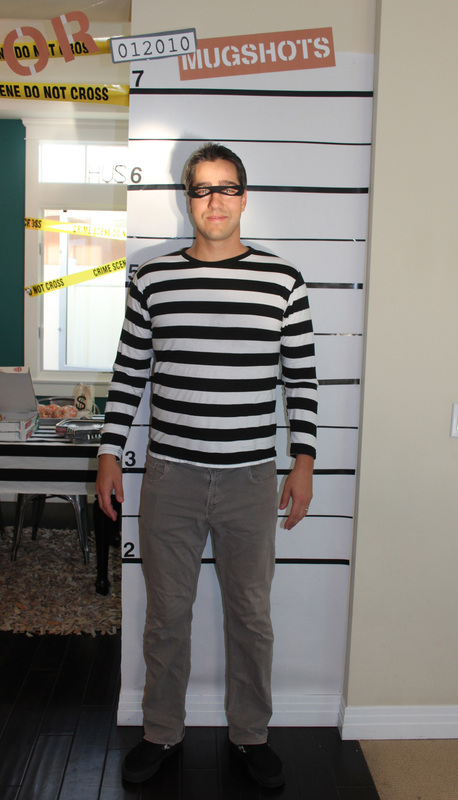 Mugshot time! 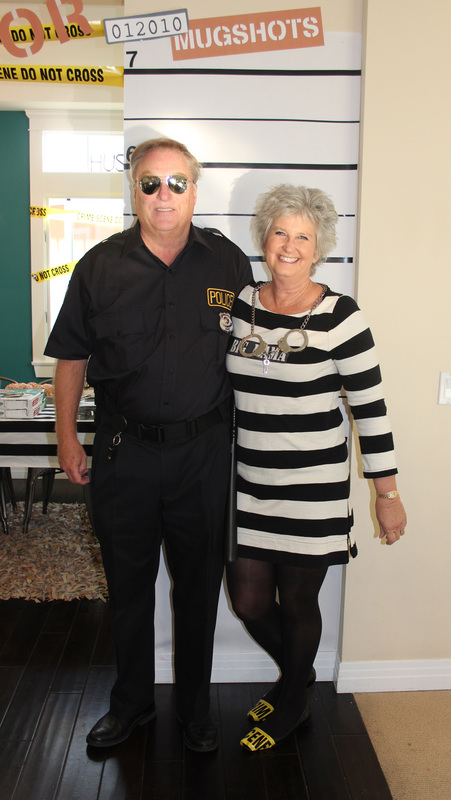 Um… how hilarious are my parents? 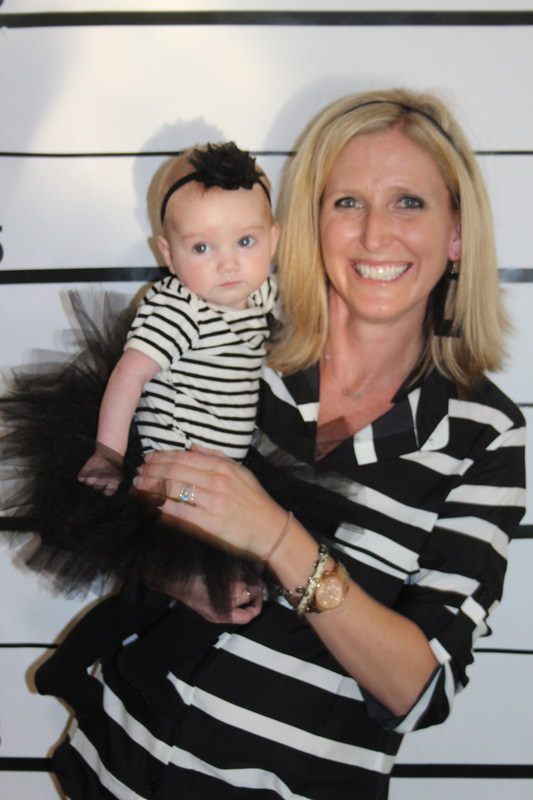 A policeman and a jailbird! Love these crazies! 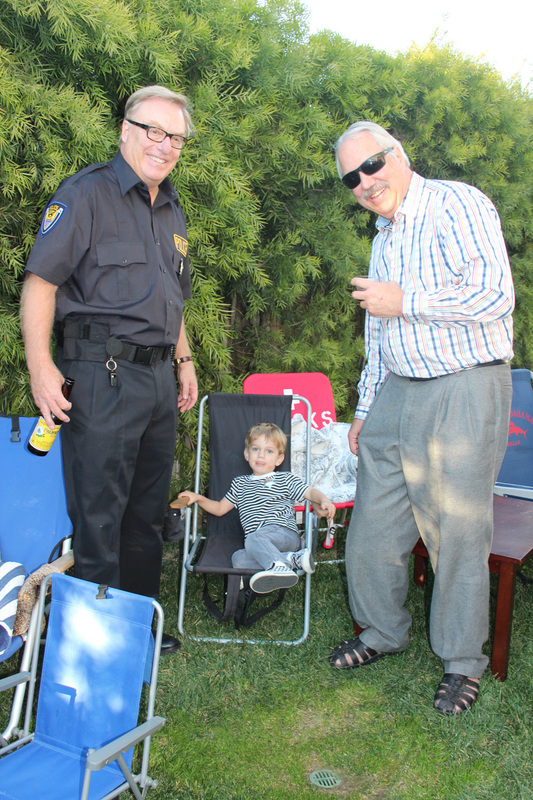 The grandpas guarded the birthday boy! 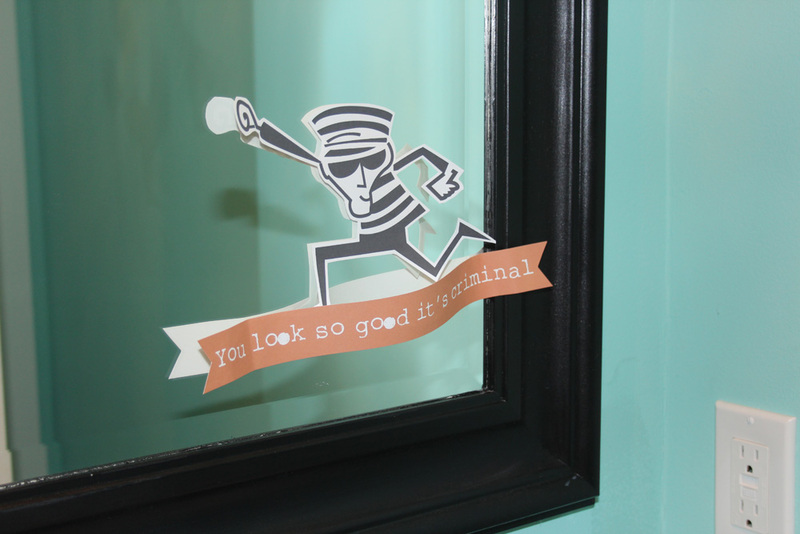 “You look so good it’s criminal”… something positive for the bathroom. Who doesn’t like a compliment? Onto the games! 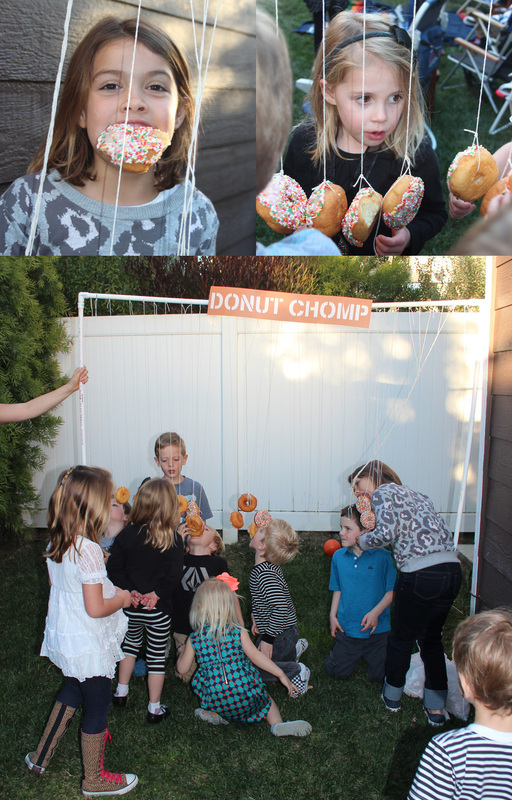 Using leftover PVC pipe, I made a frame so that we could play the Donut Chomp game. 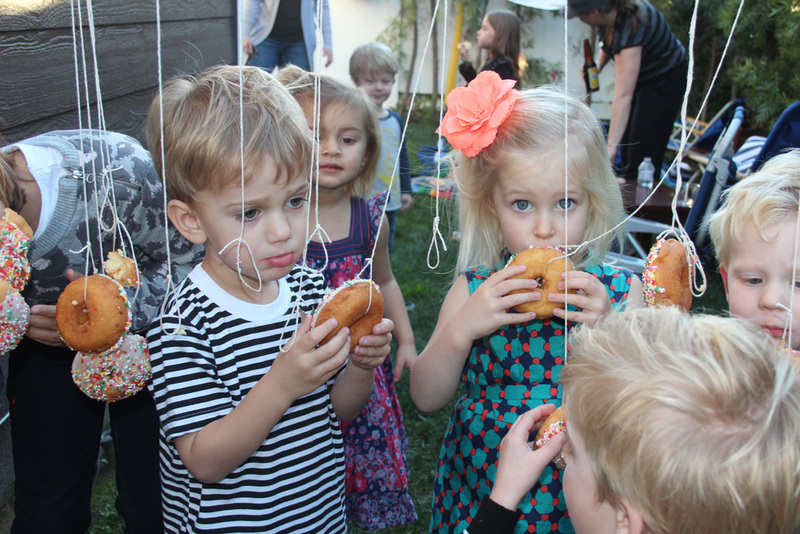 We tied them up about an hour or so before the party and then put them in bags to keep the birds away. 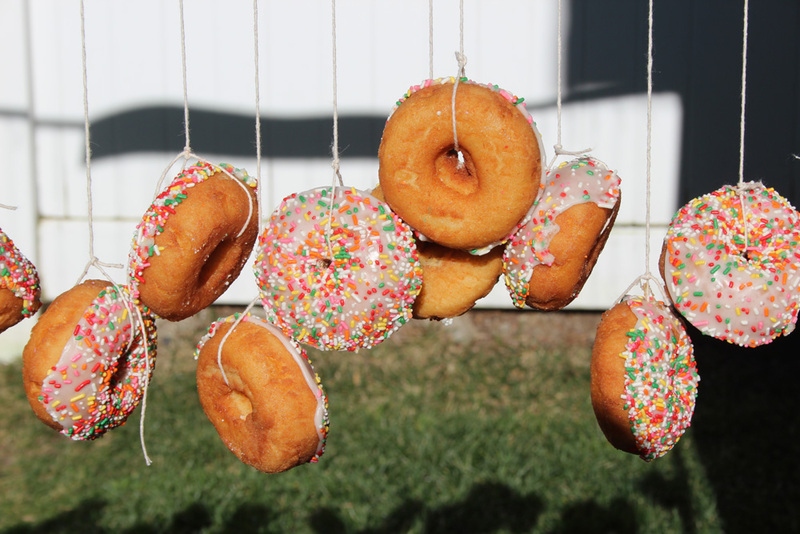 Well… if you leave a donut hanging for an hour or so, it will fall of the string. I guess this is one of those last minute prep things. 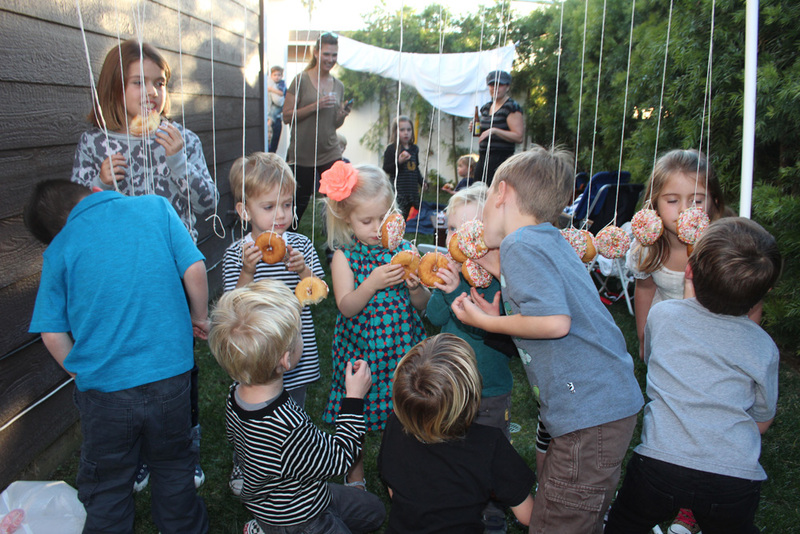 By the time the party started, about half of these donuts were on the ground… This is what I like to call: “Let’s all get the flu!” Because most of the donuts were falling, we played this game super early, before most of the kids got there. It was a hit! 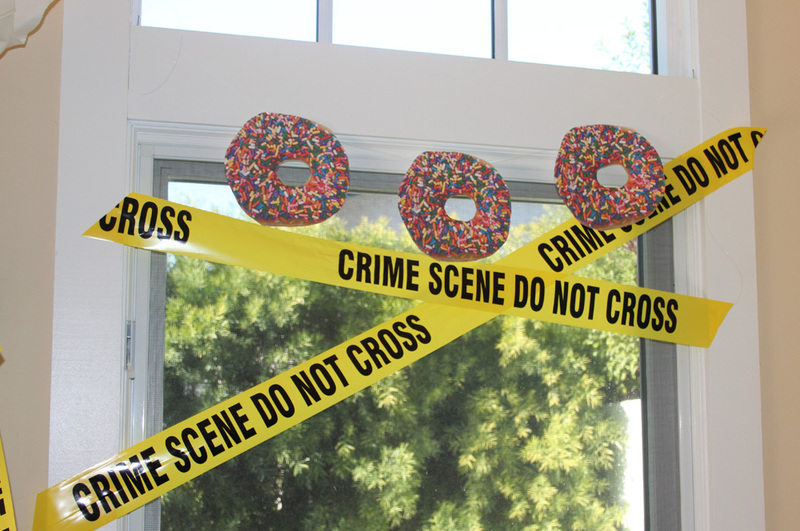 When most of the kids had arrived, we decided it was time to catch that pesky Donut Thief. 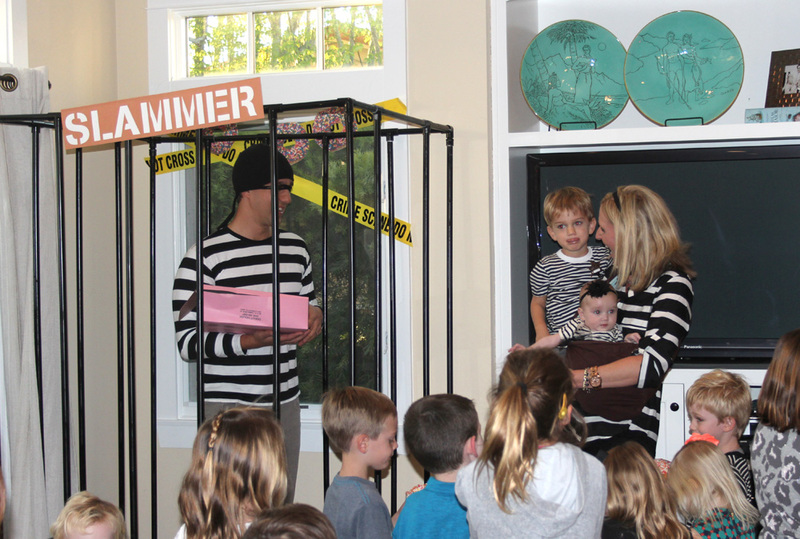 I nerded out and told the kids that in order to find the thief, we had to do the “Criminal Claps” which is where they followed my clapping patterns, the “Robber Run” which is where we would run slow, then fast, then slow. Then we had to do the “Swindler Shimmy” which was super cute to see 3-5 year olds shimmy! 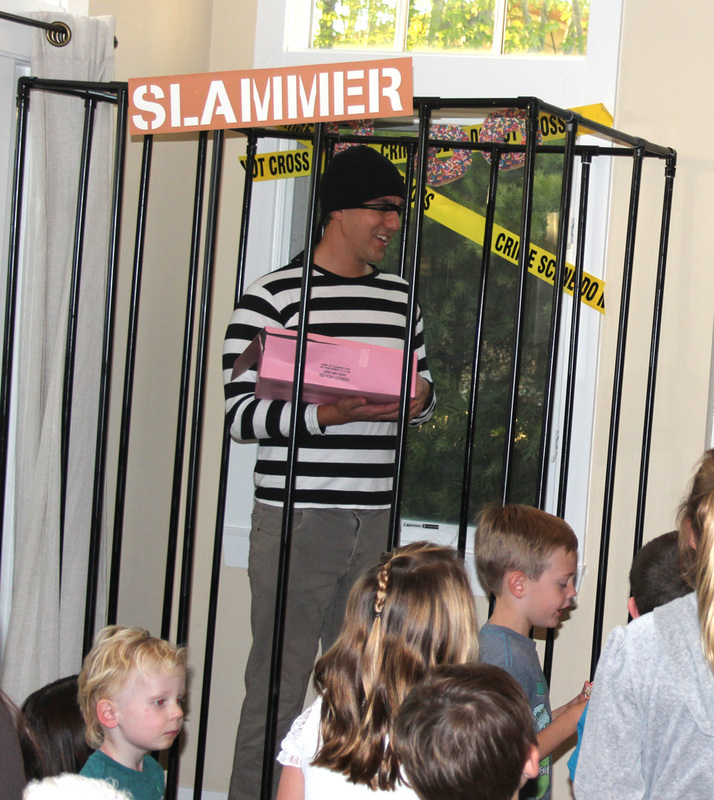 And finally we had to do the “Hooligan Hoedown” which is where Nicki Minaj took over for me and we all dance to “Starships.” After that, my husband peeked out from the side yard decked out at a thief with a donut box and all the kids had to grab him and put him in the slammer! I have to say, I was stoked when this part was over! 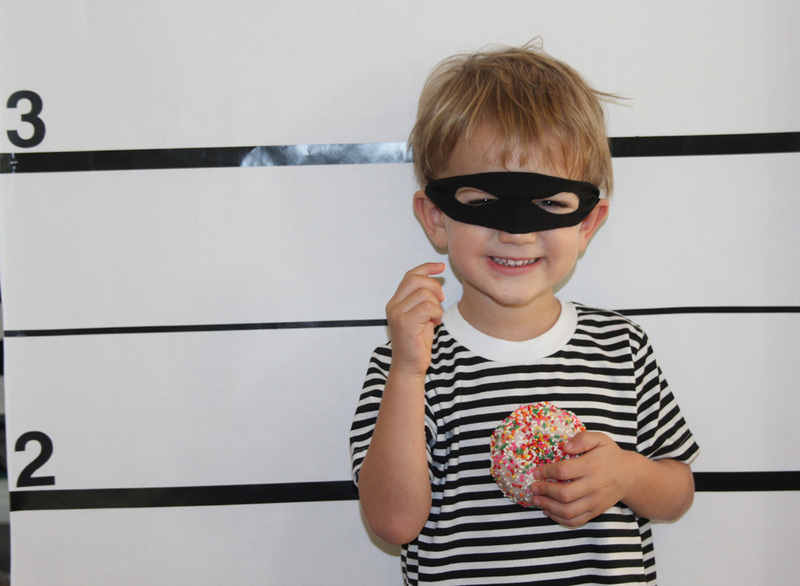 If only I could have hired a thief impersonator to entertain the kids! Ha! I don’t think I have a future with the Wiggles! 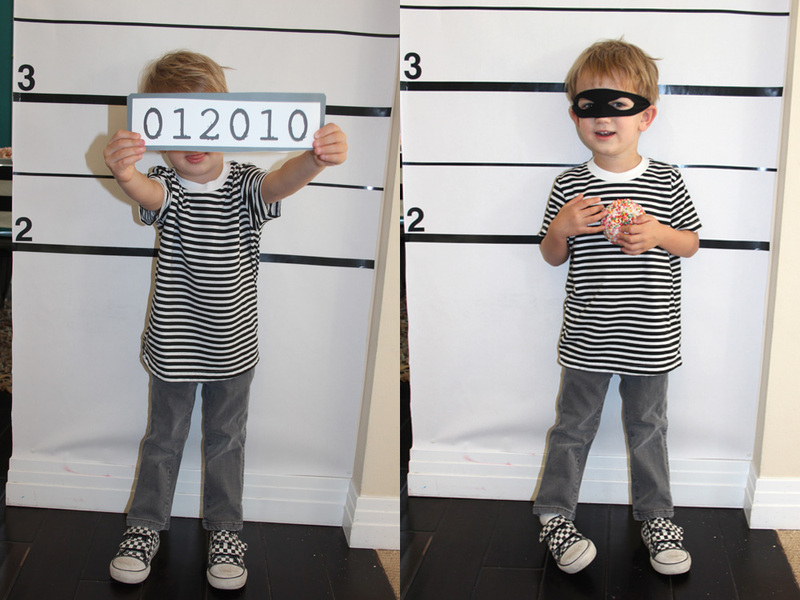 My huz made quite the cute thief though! 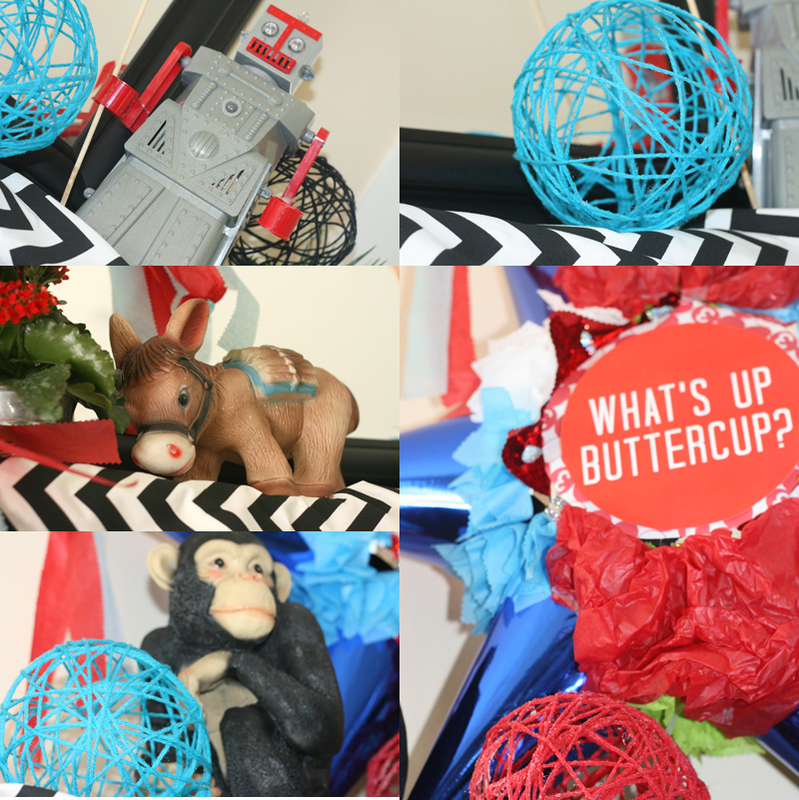 I also set up a craft… which I have to admit, I did not have high hopes that anyone would do based on other parties we’ve thrown, but I was surprised! All the kids dove right in! 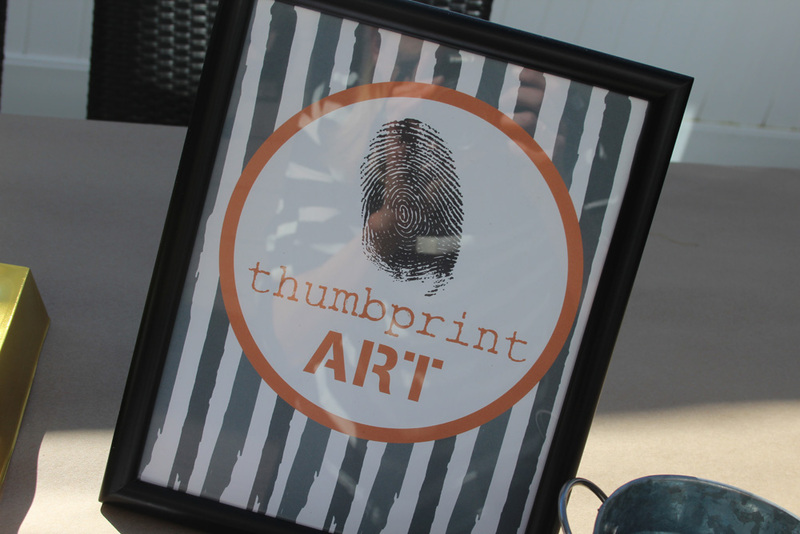 We did “Thumbprint Art” and I just made up sheets to give them some ideas of what they could create. I wish I took a photo of the end products! 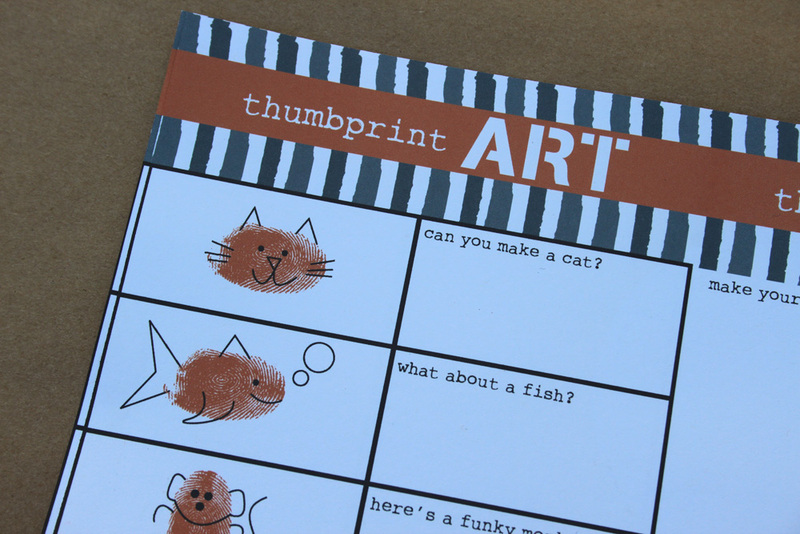 There were so many cute pieces of art. 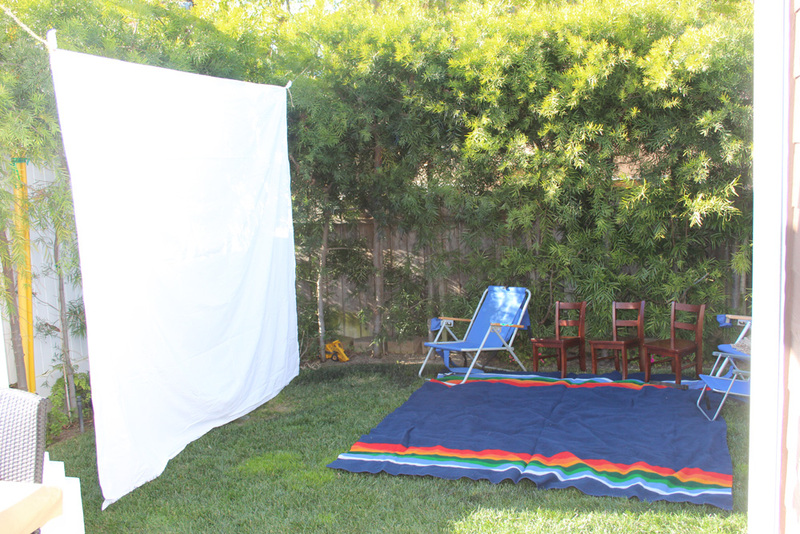 And finally, we set up an outdoor movie on a sheet in hopes that at least SOME of the kids would chill! They did! I wish I took photos of all of them cuddled up but I honestly didn’t know where my camera was most of the night and I was having too much fun to care. The movie? Robin Hood of course! Only the best kid’s thief movie ever! 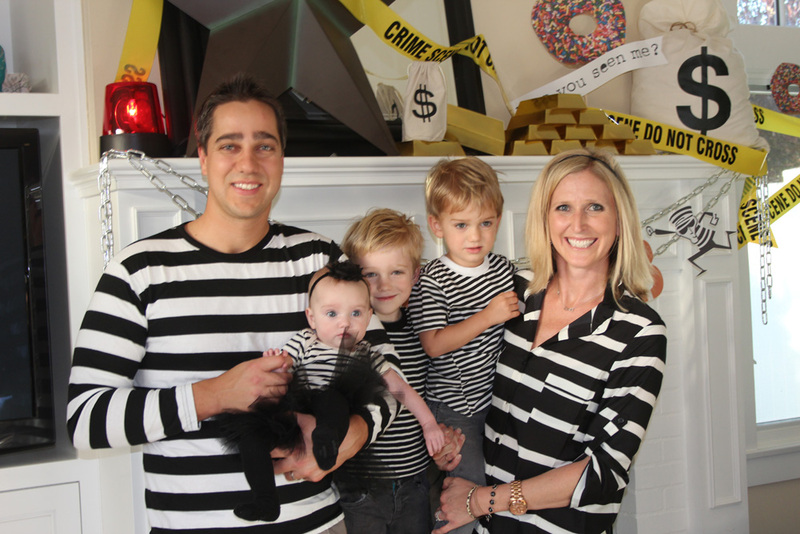 And if you didn’t catch it before… yes we dorked out and all dressed like thieves. One day this family of mine will revolt! I just know it! Until then… we’re a big bunch of party lunatics. This sweet boy of mine had a great night… which is all that really matters. I just loved the theme he chose. And I have to say, parties are only as fun as the people who come to them and we are truly blessed with the people who come to ours. Super grateful for our amazing friends and family. The last detail? 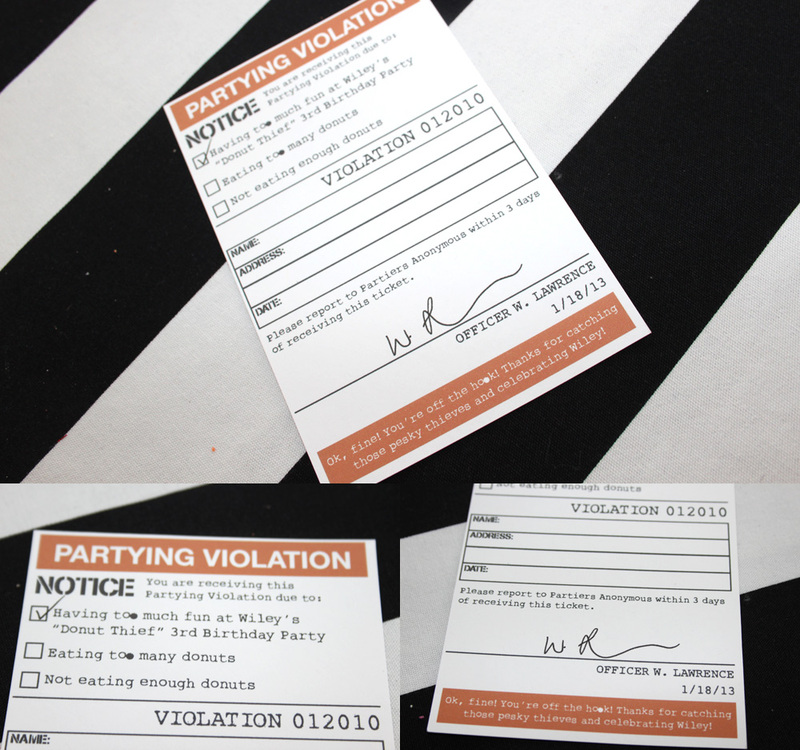 I snuck out and put “Partying Violations” on everyone’s car before they left the party. Apparently it almost gave a few people heart attacks at first, but I think it was pretty funny! 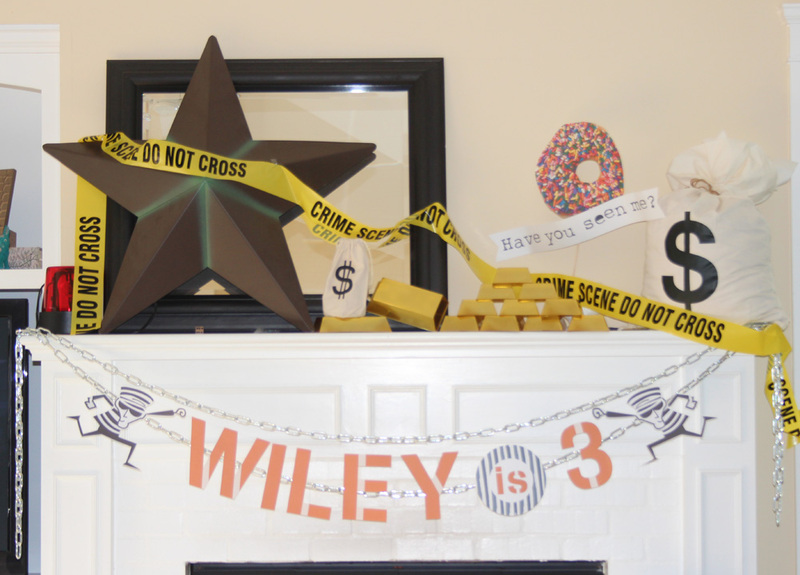 Wiley is 3! The party is done! And this mama’s got her house back after having it decorated for something or another since October! Whoo! Happy New Year everyone! Hope to write more posts soon! 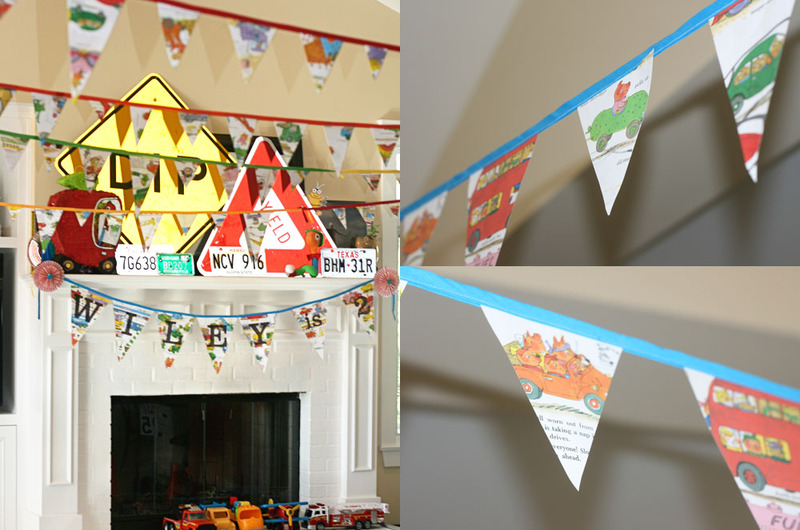 Part One — The Decorations. I honestly, truly thought that for this party I was going to keep things simple, but the truth is that Simple & I aren’t good bed buddies. What we got instead was a full-on explosion of street signs, book pennants, box buildings, and vinyl roads. My brain just wouldn’t quiet down and I knew that if I didn’t “just do it” I would be bummed. So, here goes. 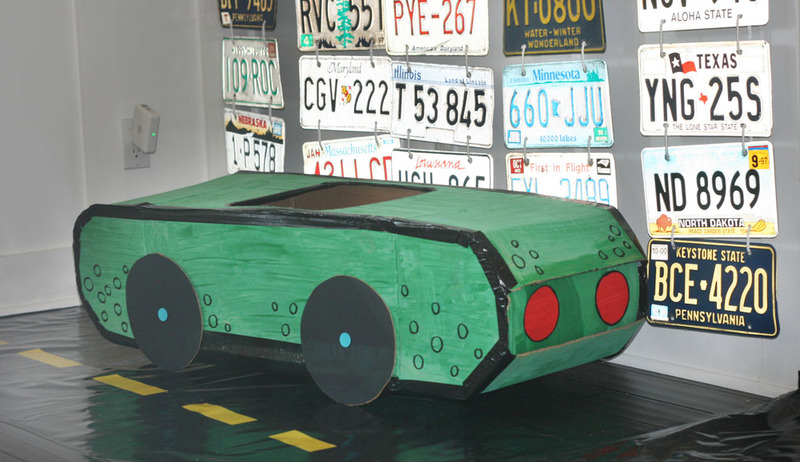 Here’s a big fat “Cars & Trucks & Things That Go” KABOOM blast for you. Come on in and let’s get motoring. 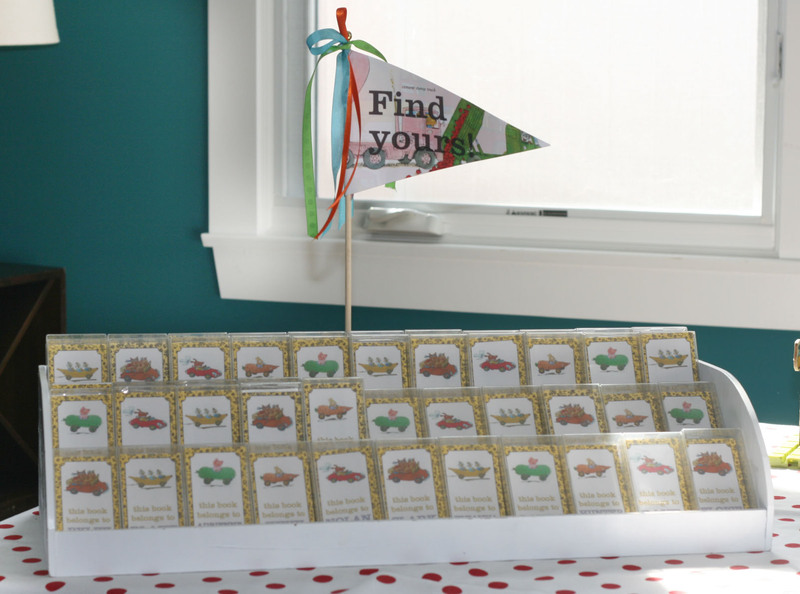 I mentioned before that I used the pages from about 5 books for this party which left me with the covers. 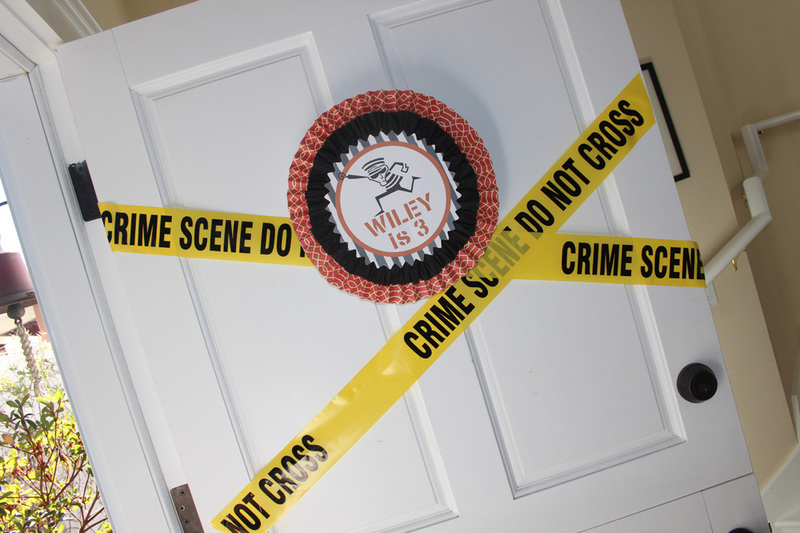 I hung one book shell on the door as a welcome sign but covered Richard Scarry’s name with Wiley’s. Not sure if anyone even noticed that but I’ve realized that so many of these details are things that I do just because it makes me happy even if no one sees. Oh the things I spend my time on. 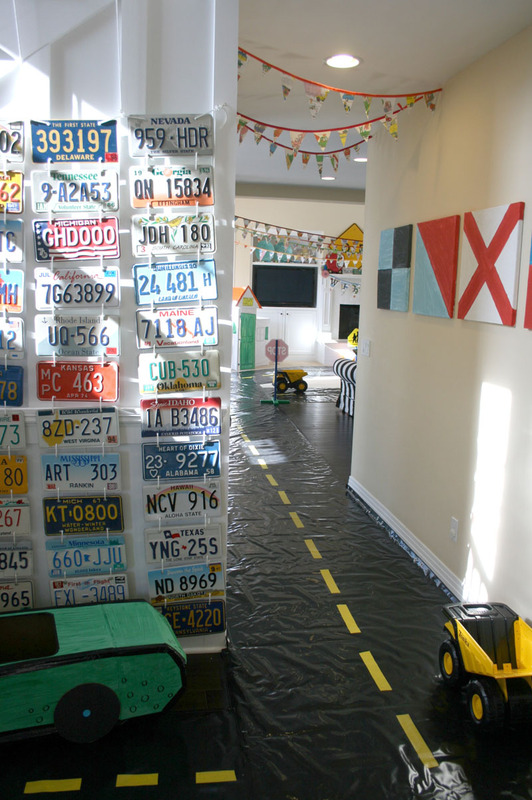 Upon entering, guests were greeted with a license plate wall (more on that later in the week)… …a pickle truck made from a box (Wiley’s favorite car in the book), and a vinyl ‘road’ leading you down the hallway and to the party. 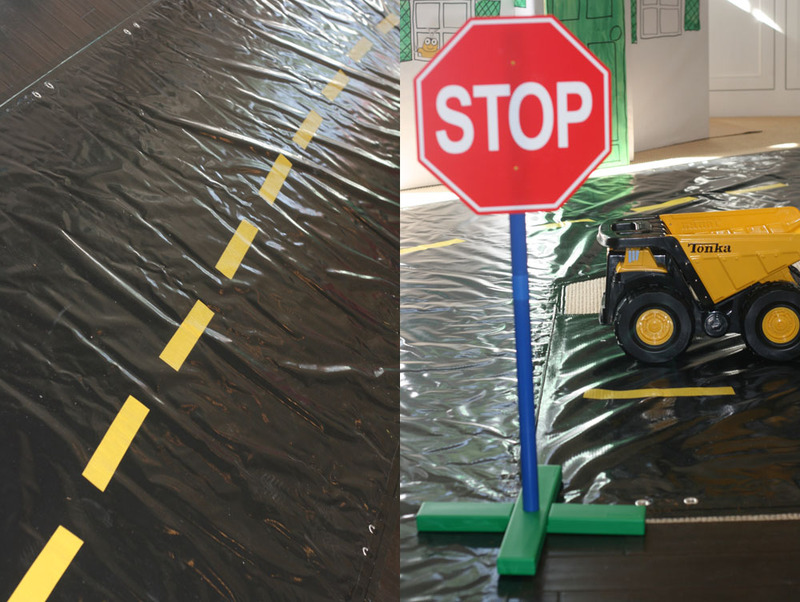 I bought an irregular 25 yard roll of vinyl on sale from US Cutter and added yellow duct tape to make a proper road. (I am selling it right now in my Etsy shop. *UPDATE* The road has been sold!) 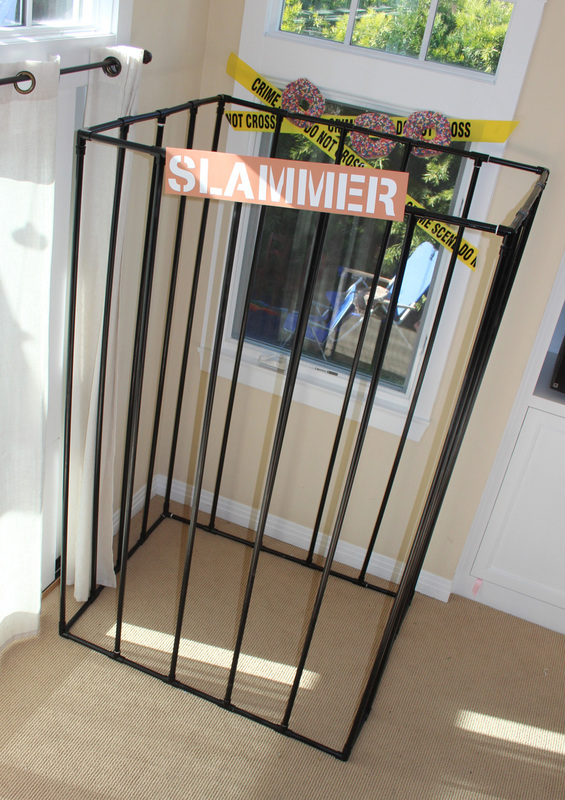 It turned out super rad, though I have to admit I totally felt like Dexter while preparing this thing. 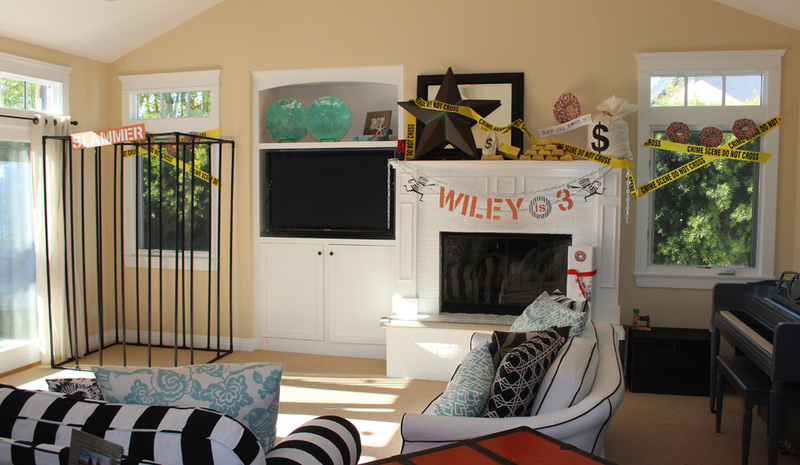 There’s something a little creepy about essentially tarping your living room. 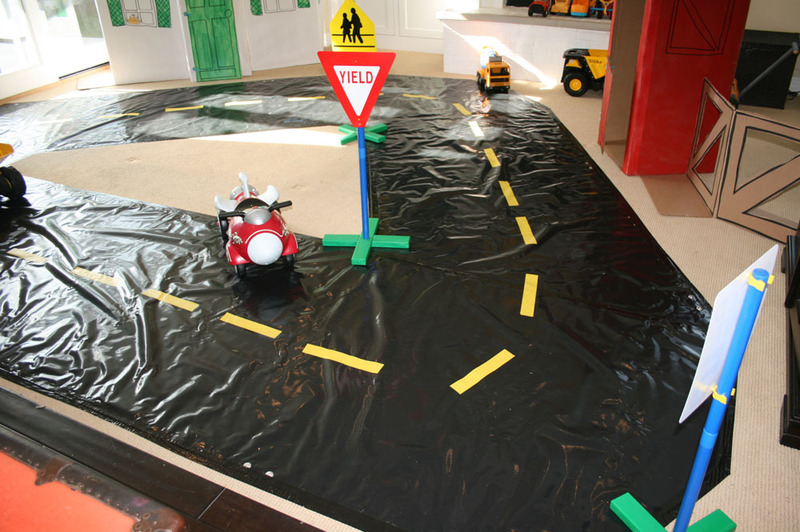 But once the yellow lines were in I felt better about the whole thing. 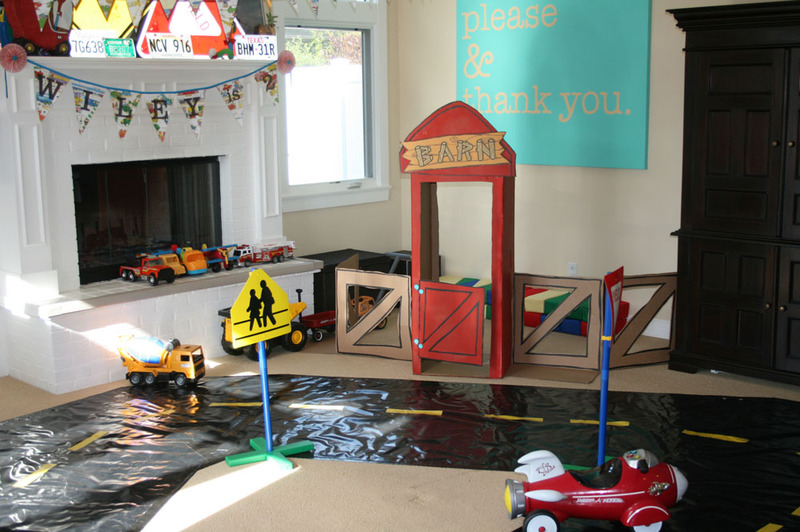 We took all the furniture out of our living room so we could make a circular road for the kids to play on. We got out all of our big trucks, set up street signs, got our box city up and let the kids go bananas. 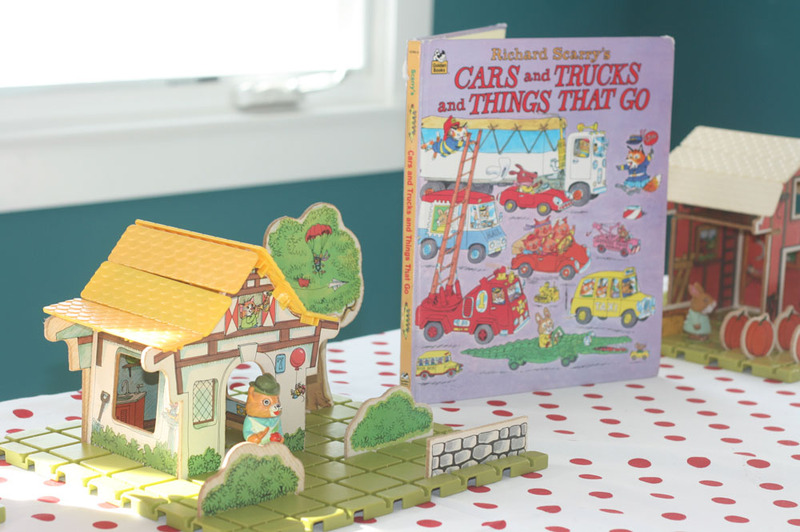 The box city was based on buildings in the Richard Scarry Puzzletown toy that my brother, sister, and I grew up playing with. 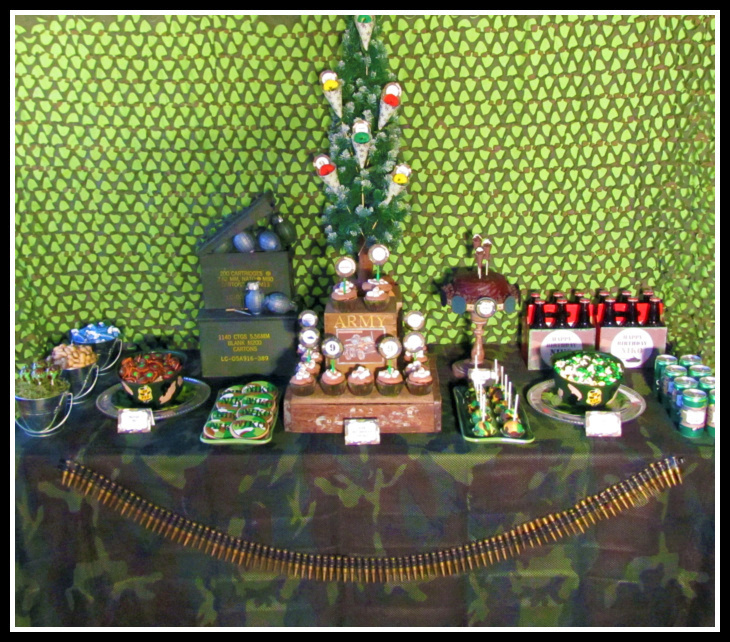 The real toy “town” decorated the tables. 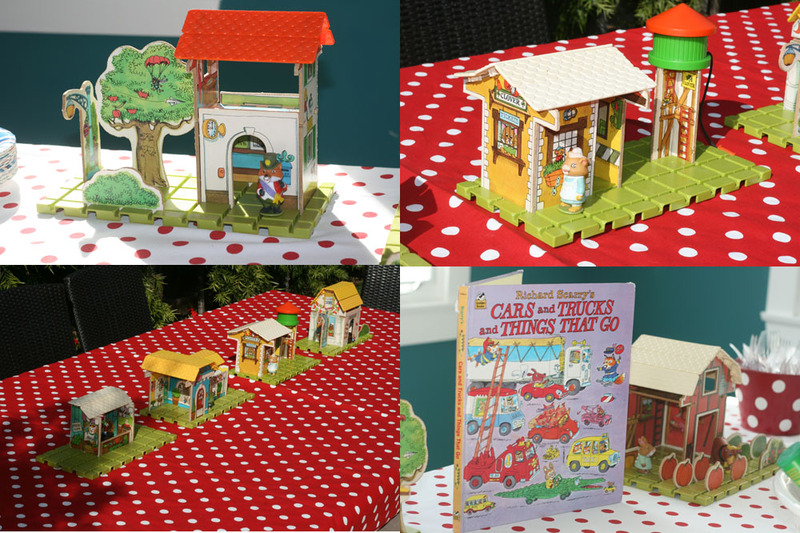 It’s truly the most creative toy ever that even though my parents still have the one we grew up with, we actually scoured eBay last year for all the packs to give my older son as his 3rd birthday gift. They love it just as much as I did. But back to the box buildings. I wanted to stay true to Scarry’s line-drawn style and since I’m not a perfectionist anyway, I kept things super loose by hand drawing the details and purposely not paying attention to keeping things super straight. 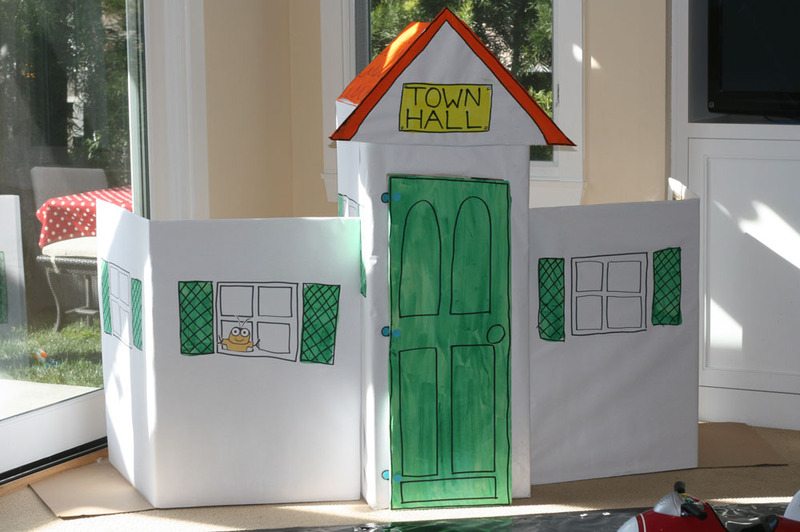 Town Hall was in one corner… …the barn in the other. 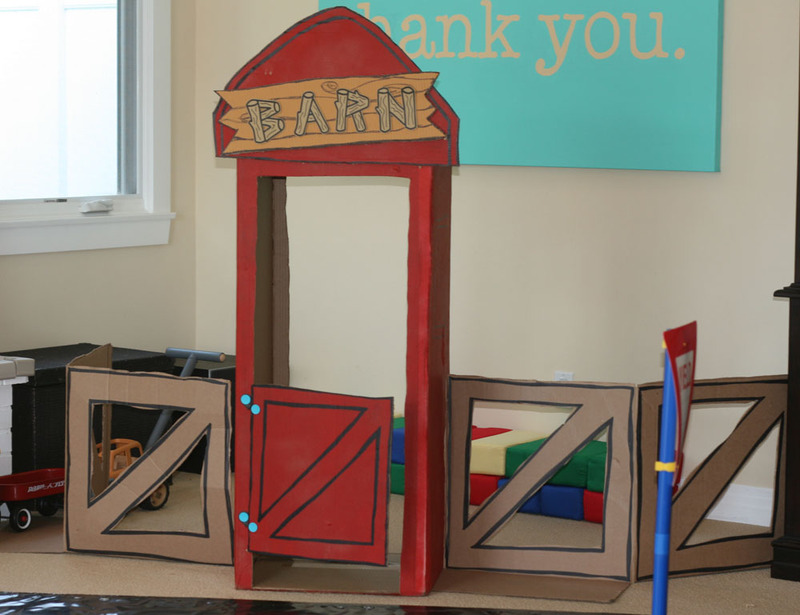 (My mom made the barn sign which is why it looks better than everything else!) I used makedo bits to make working hinges on the doors. Pretty cool gear for box cities and box cars if you ask me! Using book pages (many of which were drawn on by previous owners and/or upside down… again – I’m no perfectionist!) 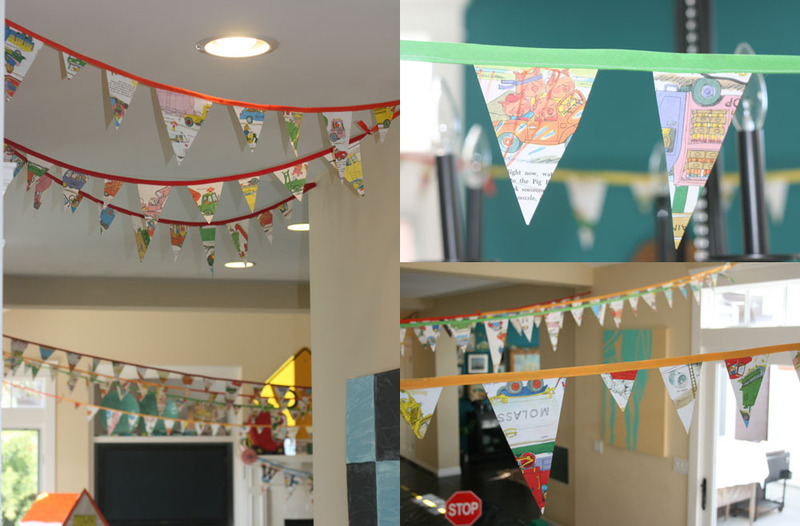 and seam-binding, I sewed about what seemed like 20 miles worth of pennant banners and strung them throughout the house. (I am also selling these right here in my Etsy shop.) 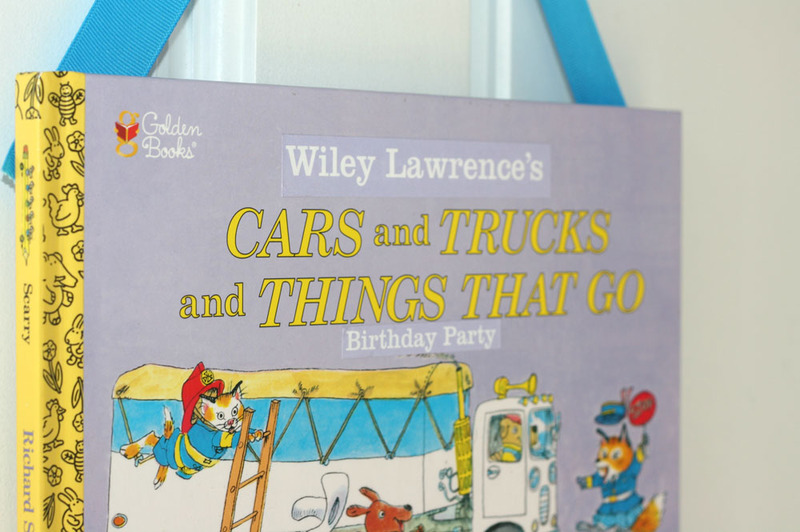 They tied the book into the party a little more and were so bright and colorful they just made me happy. 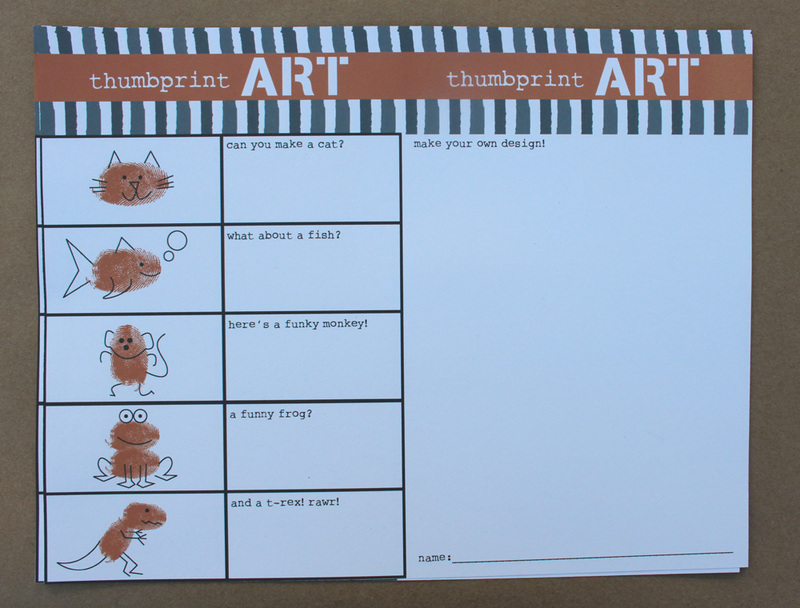 Can you see some of the black sharpie on these pages? I’m glad that these essentially “ruined” books got another shot at life. 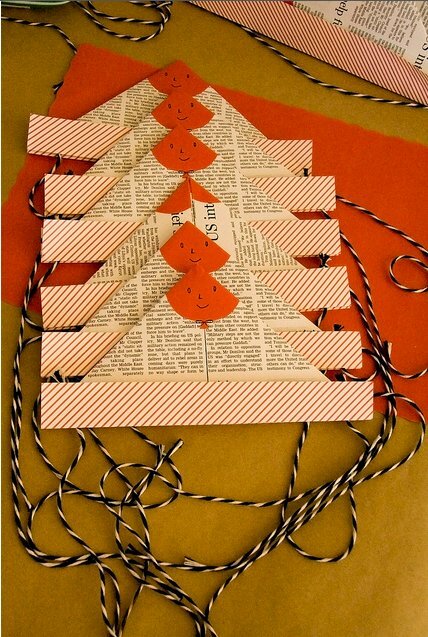 (If you buy these, please note that they are NOT perfect but they look great all strung up together! Just want to manage expectations here!) 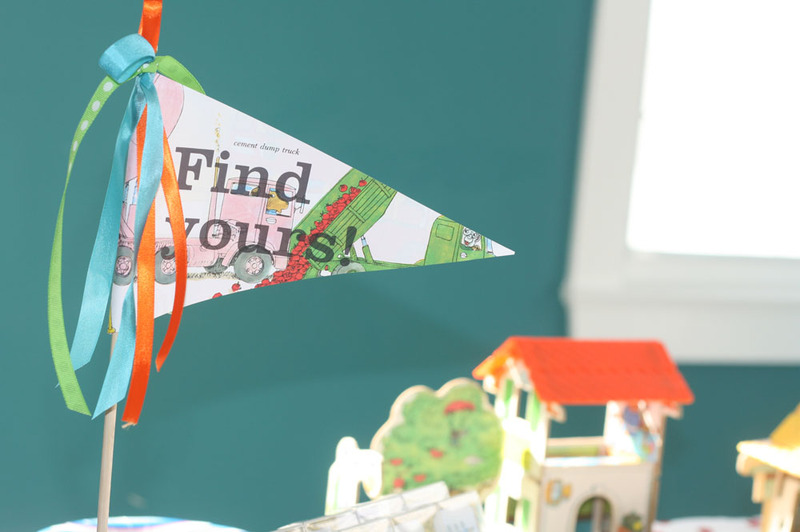 I also used book pages to make the birthday boy’s banner. I just printed directly onto the page, cut it out, and sewed it up. 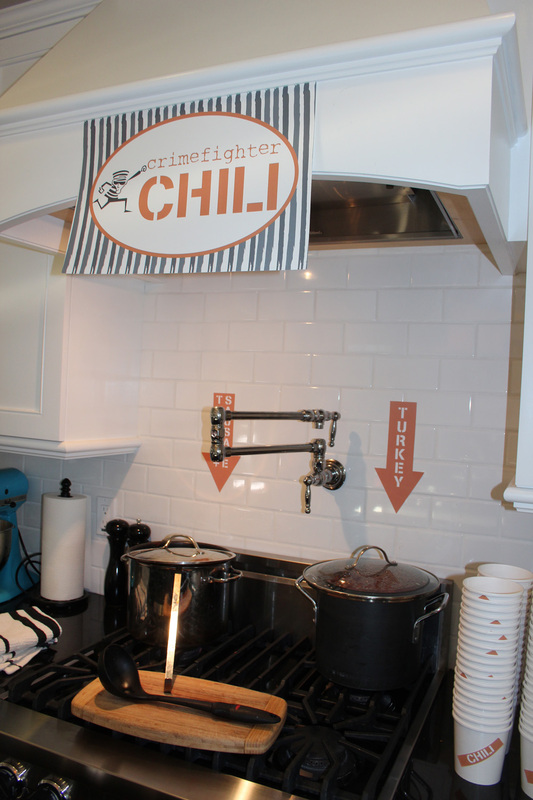 This technique was also used for “the loo,” the bag room… …and above the food table. 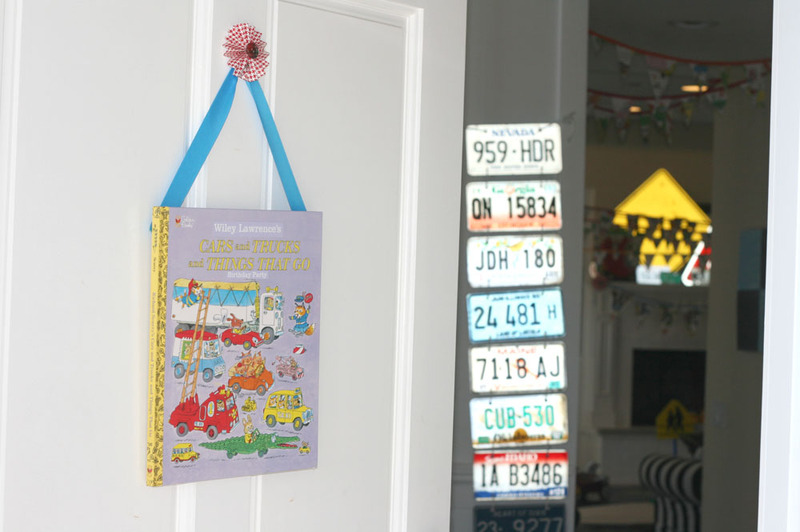 Speaking of the loo… …Goldbug (who is a big fixture in the book) turned up in there to say “Hi!” My mom had a license plate purse that we turned into a towel holder. Don’t neglect the bathroom, peeps! 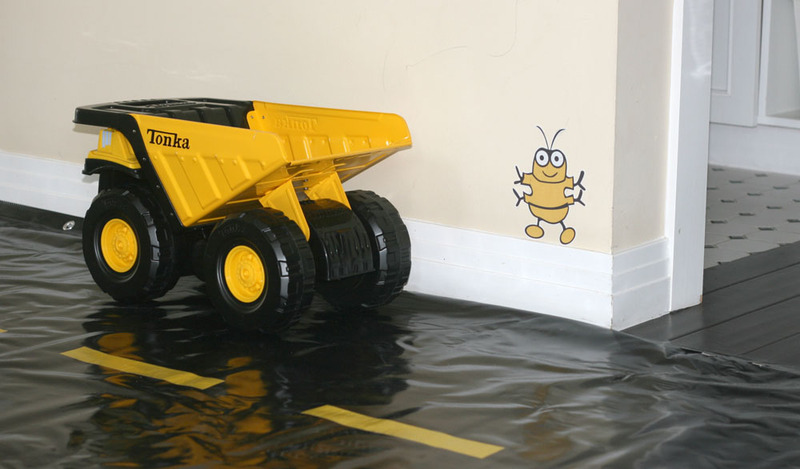 Now that I mention Goldbug, he seemed to turn up just about everywhere at the party! In the book, he is hidden on every page and my boys know exactly where he is on each one. Using that philosophy, I hid him all over the house. First he hid by the baseboards. 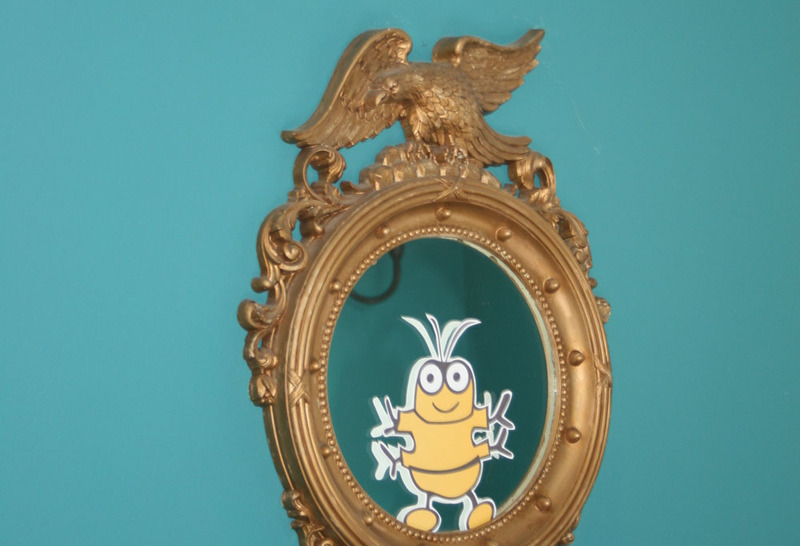 Next, he turned up on a mirror. 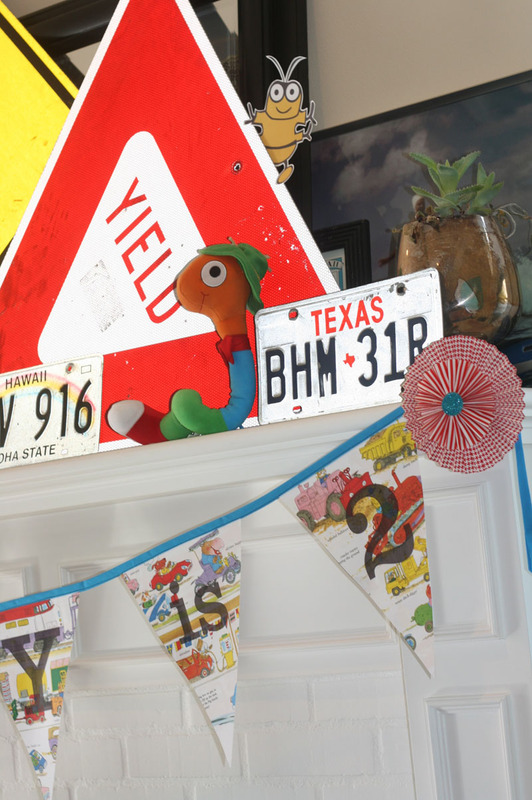 Then he hid behind the Yield sign on the mantle. 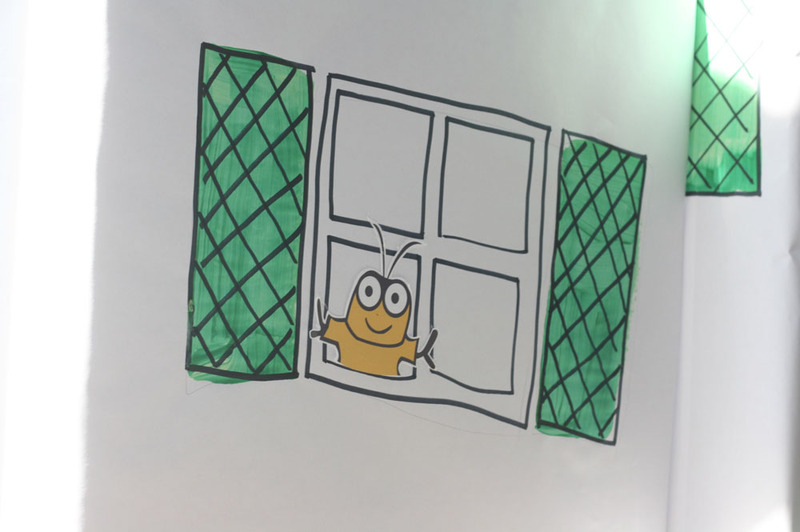 And finally he popped his cute little face through the window in Town Hall. Funny little bug. 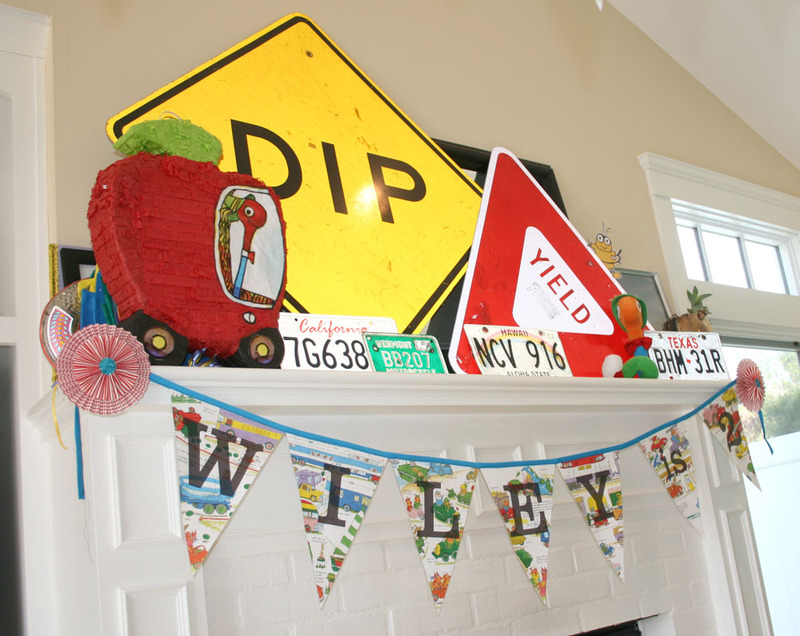 The mantle was decked out with a Dip sign (that my husband stole for me in high school because for some reason that’s what I wanted for Valentine’s Day. See? Even then I was off my rocker.) 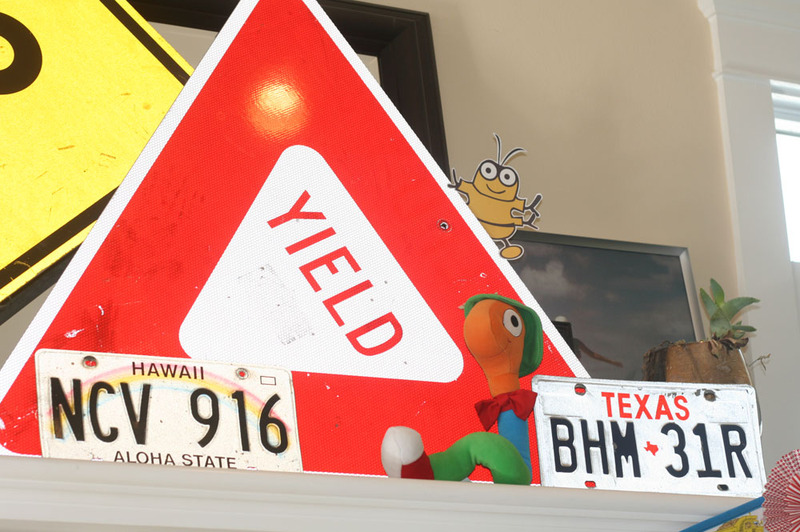 and a Yield sign that I think someone gave to me at some point because we just found it in our garage when I fished out the Dip sign. 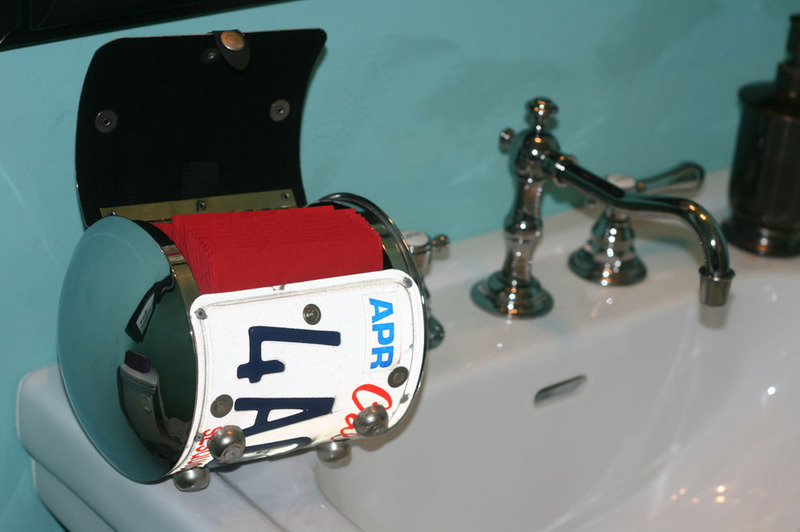 The license plates are part of a larger collection that I will explain later this week. 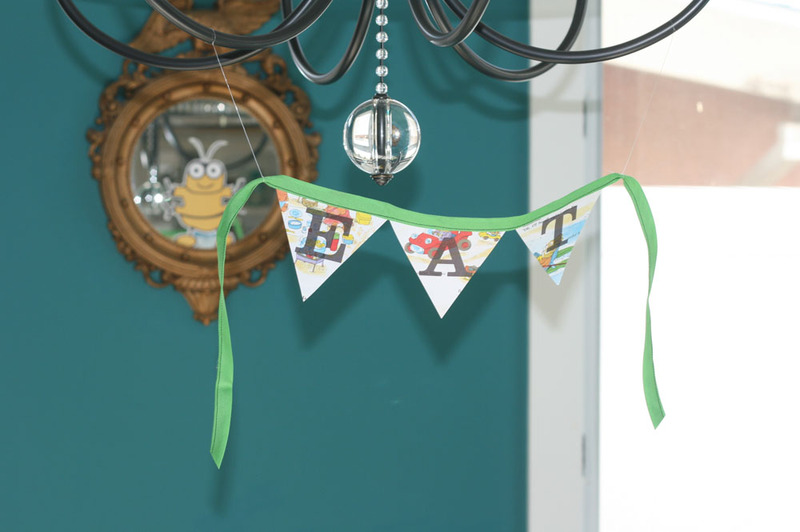 I got a Lowly Worm piñata from Birthday Express and used it as mantle decor instead of hanging it. (More on this later in the week as well.) We also found a Lowly Worm stuffed animal that was on sale around Christmas so I snagged him up. 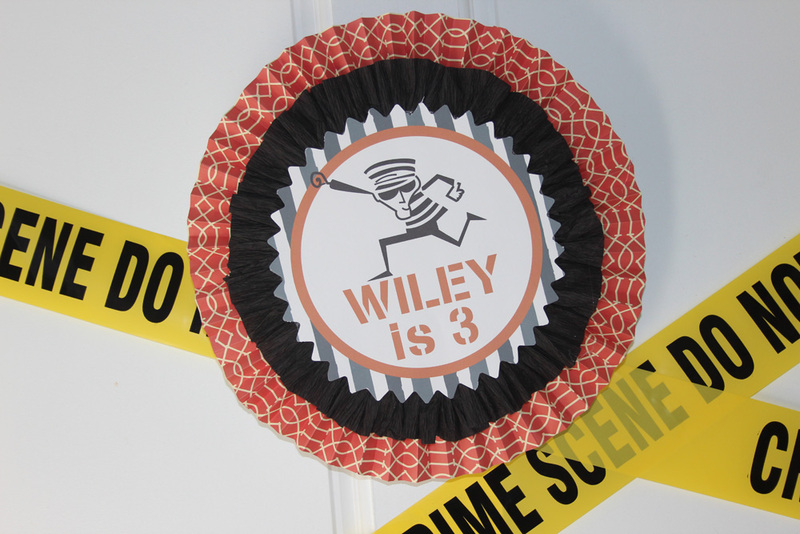 My mom made ALL of the cool rosette things you’ve seen throughout the party. I love her perfect touches. 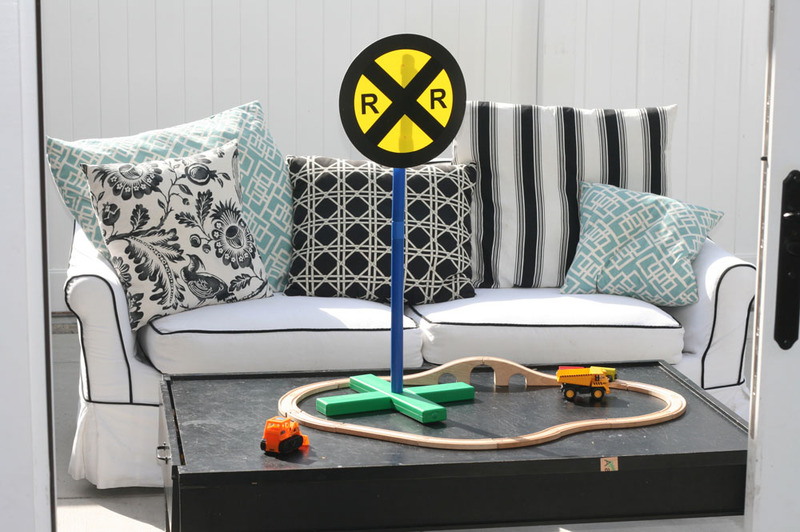 We moved our couch and coffee table outside for the younger kids to play on and it worked out perfectly. 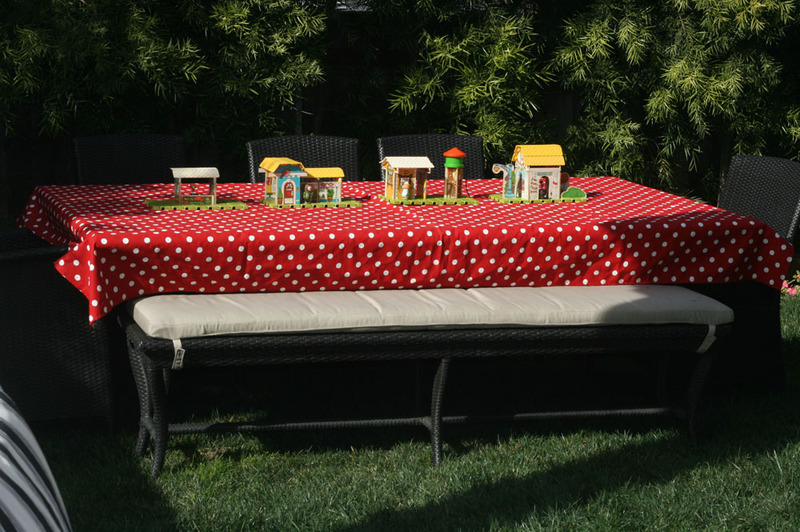 We also set up the ‘town’ on the table outside so kids could gobble up their pizza while playing. And luckily for us, it didn’t rain – though it did the next morning! The party gods had my back that day! 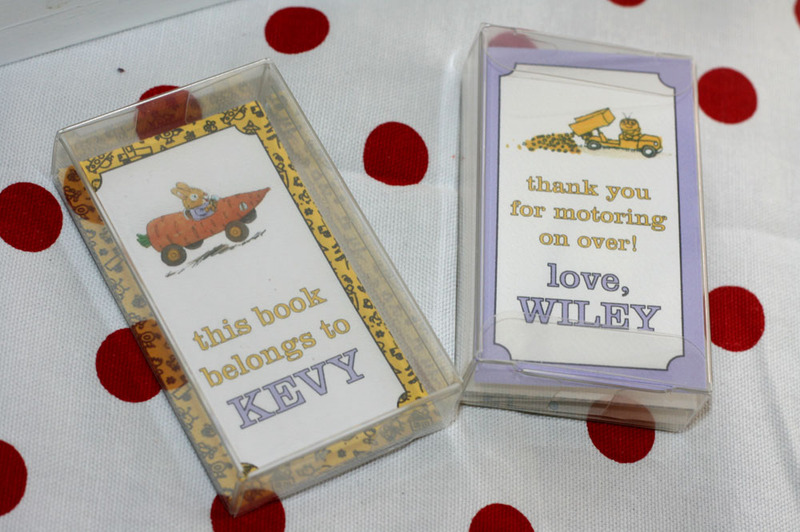 For favors, we sent each kiddo home with 10 personalized bookplates. I bought these cool business card sized clear boxes from Clear Bags. They were just what I had envisioned and I love when what’s in your mind actually was in someone else’s mind at one point too. 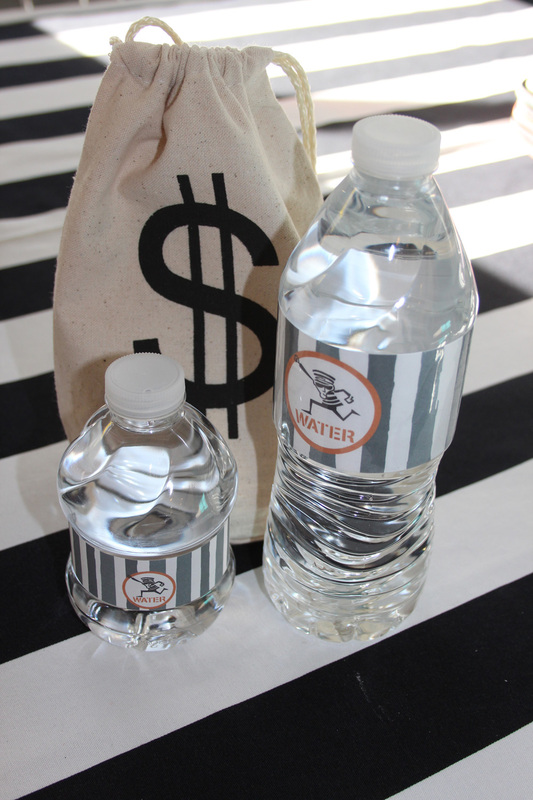 Thank you Clear Bags! My mom has this fabulous display dealio that we’ve used for everything from cake pops to glitter animals and it was 100% perfect for displaying these. These bookplates were printed on label paper so that they can be placed into the inside cover of books, so the back of the label was not pretty. 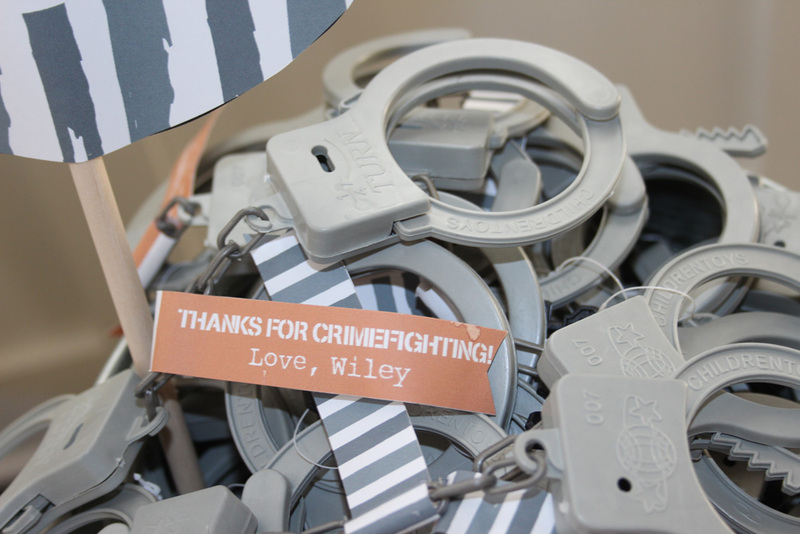 Therefore, I put a little thank you note from Wiley in on the opposite side of the labels so it would be cute from all angles. 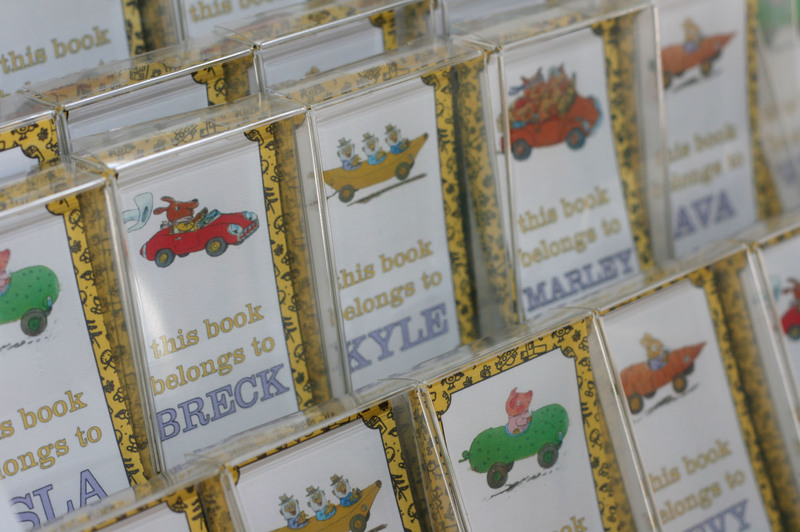 The yellow pattern is supposed to mimic the “Golden Book” spine of the book itself. 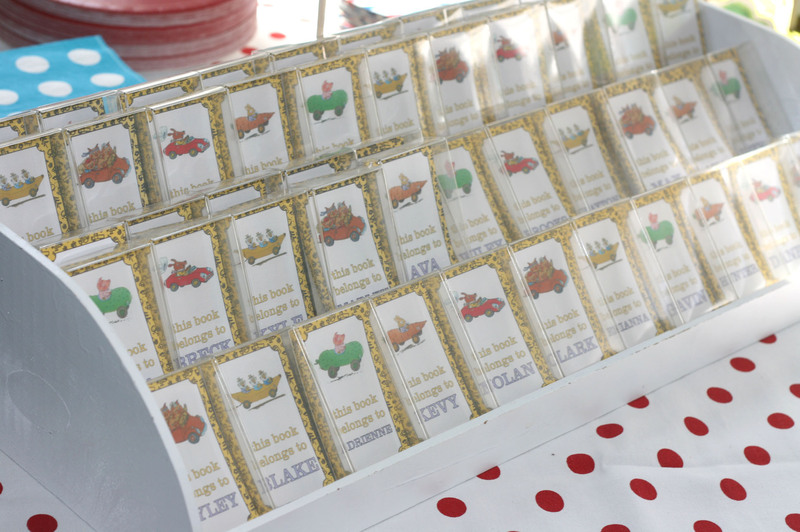 I’m not sure if the kids were excited about these favors or not – I’m sure they were a little underwhelmed and would have probably preferred a bag full of candy and a plastic yo-yo (I know I would have as a kid!) 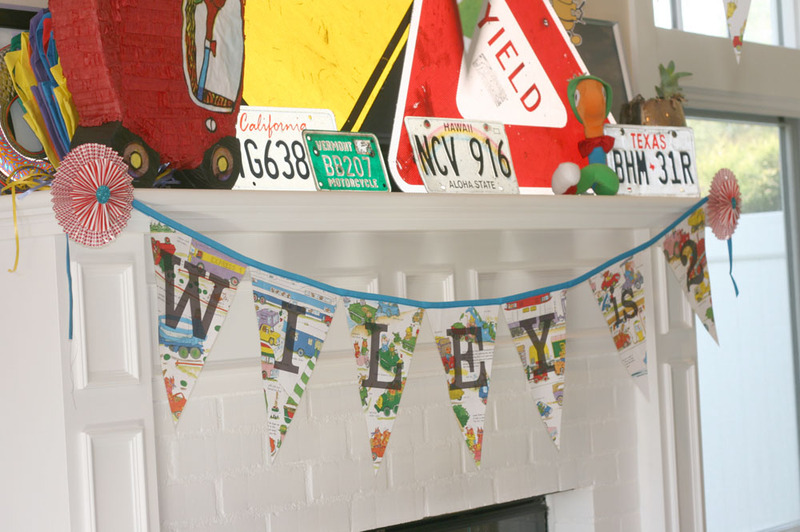 However, I know now that I’m a mom how much funky little junk can kids accumulate from God knows where so I didn’t want to add to the junk piles in anyone else’s house. If one person actually used these, I will feel pretty good about it. 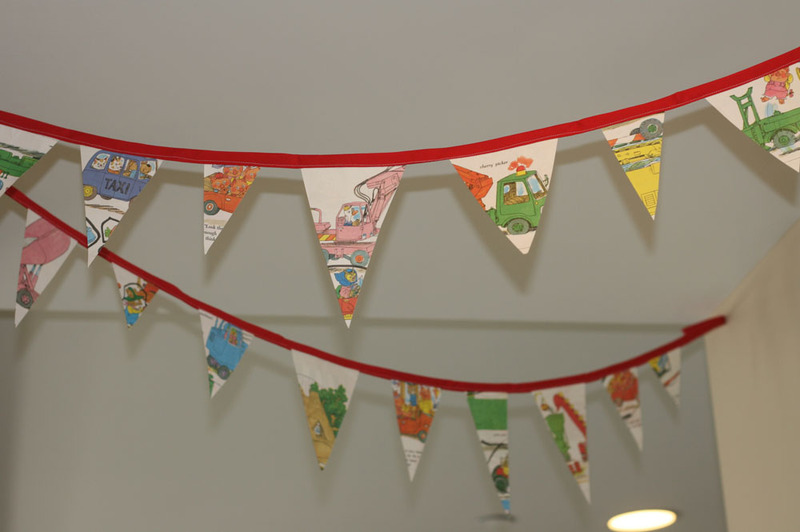 I printed on a page of the book again to make a pennant flag. “Find yours!” Now get out of here! 🙂 More posts to come on food, games, and the photobooth set-up the rest of this week! I hope you’ll keep coming back for more! Have the best day. 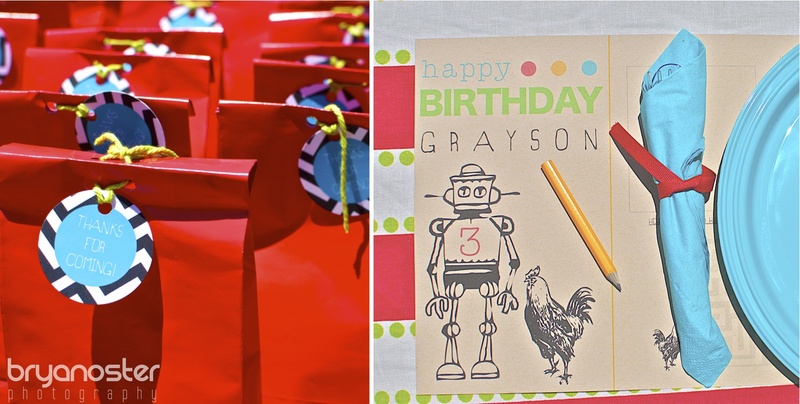 My friend Anne of Society Picnic also got a very interesting request from her 3 year old son for his birthday party… He wanted a to include his favorite things: chickens, robots, chocolate milk, a big hill, remote control cars, and their our chocolate lab Cashy-Bear. 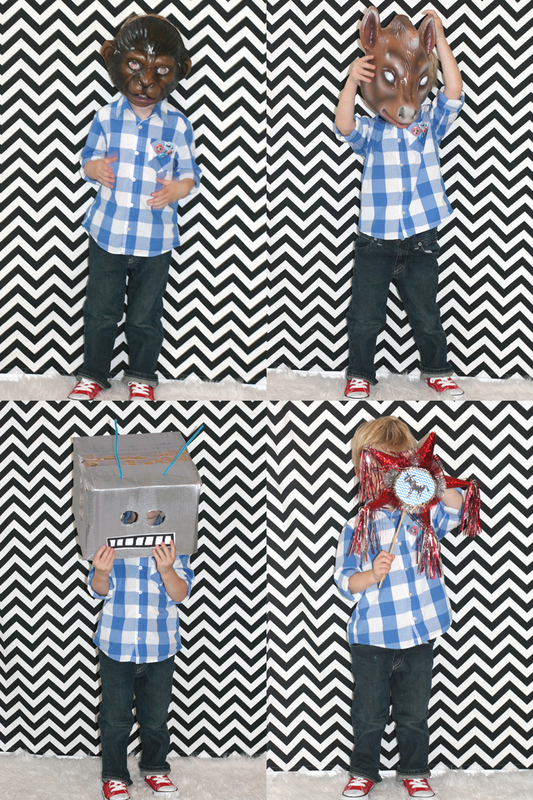 What is it with 3-year-old boys and suuuuuuper funny themes? I’m glad to know I’m not alone in having funky parties! 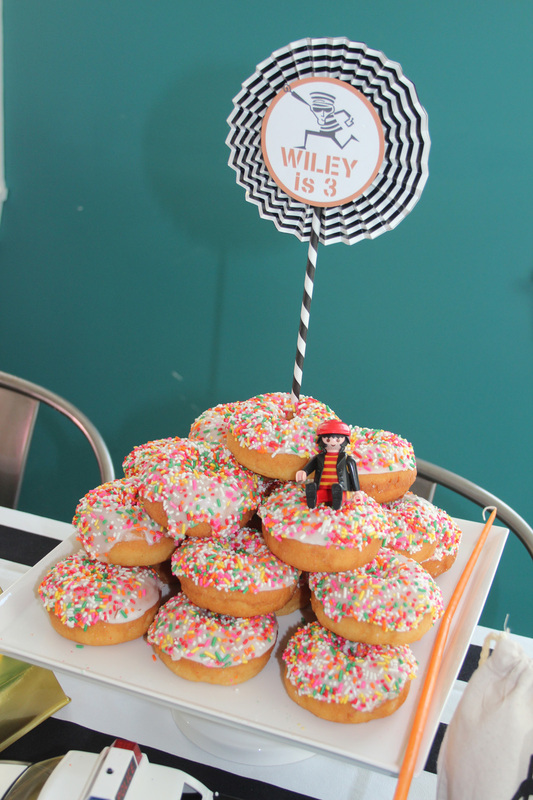 Anne did her best to make his dreams come true and the party was a stunner! 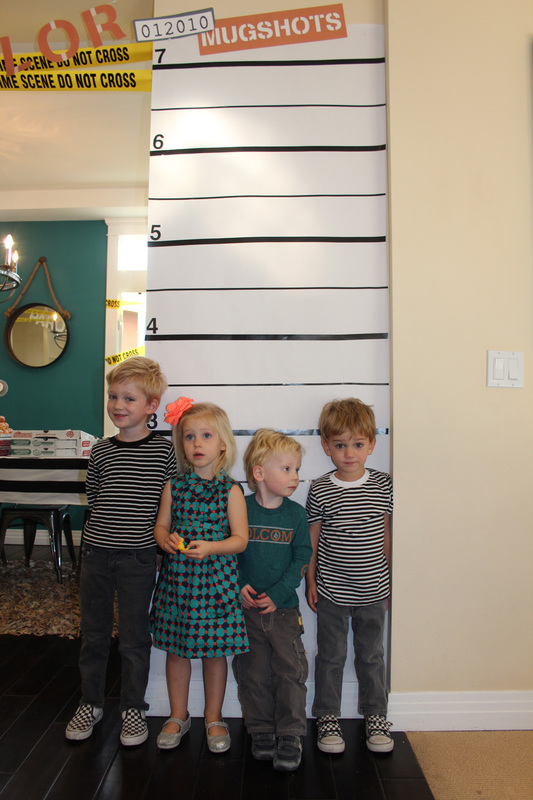 I loooooooove the cute photo booth area… The banners above say “In a Perfect Day For Gray There Would Be…” and all the kids would hold pictures of things he loved. Too clever! For more stunning photos, click here. 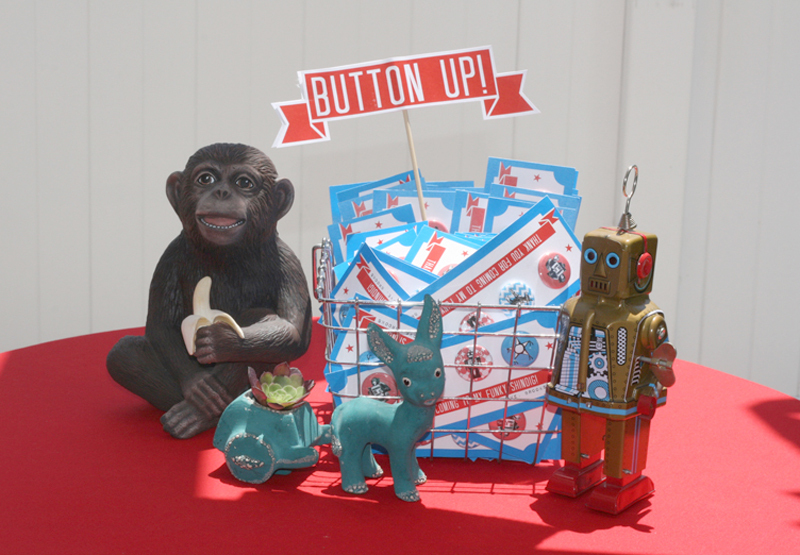 What do you get when you cross a monkey with a donkey, robot, piñata, 38 kids and 64 adults? One hell of a party! 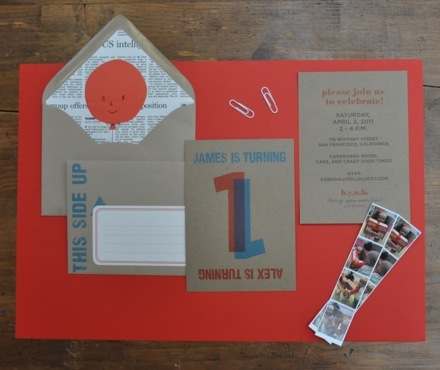 You may remember the invitations I posted from earlier this month? 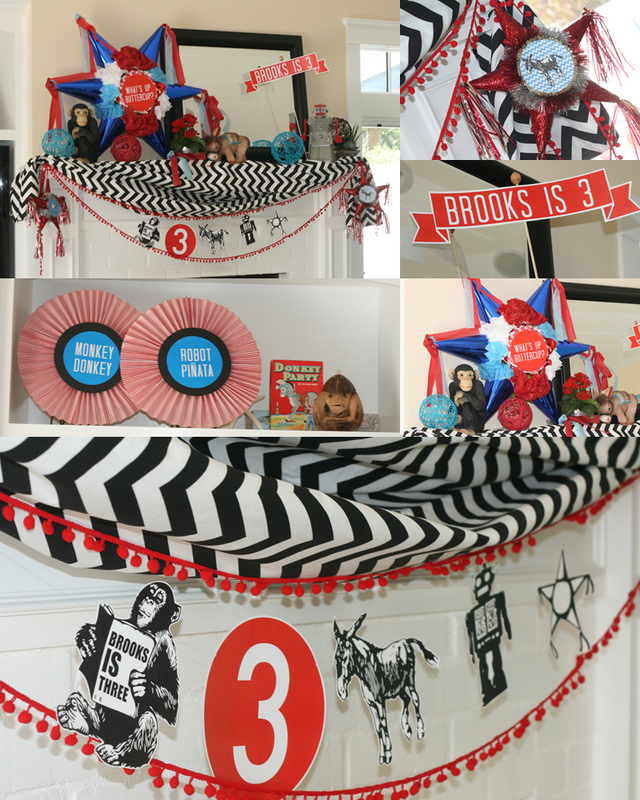 In that post I also explain why the heck we threw a party like this for a 3-year-old! You can bet it wasn’t my idea! Anyway, I’m splitting this whole shebang into a 5 part series. (I cannot believe that this will take me a week to get through!) Today, I give you the overall details. 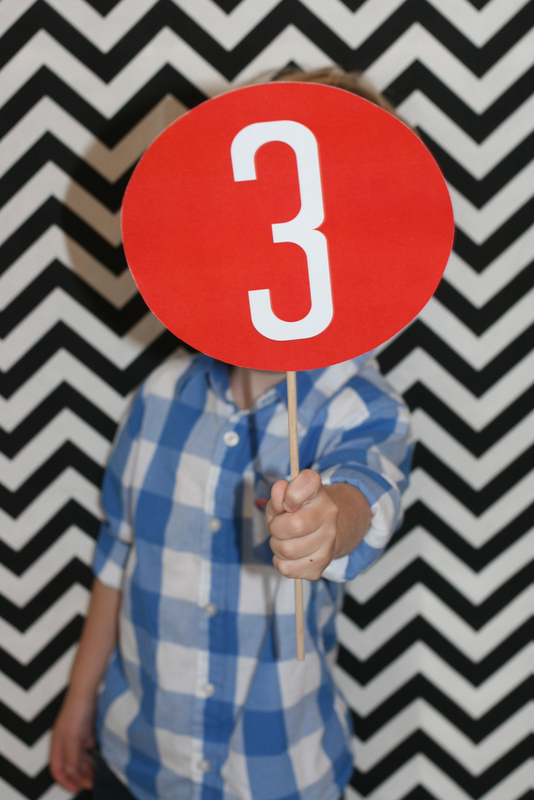 The rest of the week will go like this: Tue – Food & Dessert, Wed – Photobooth, Thu – Games, Fri – Wrap up. Start your engines! Let’s roll! Welcome to the party! 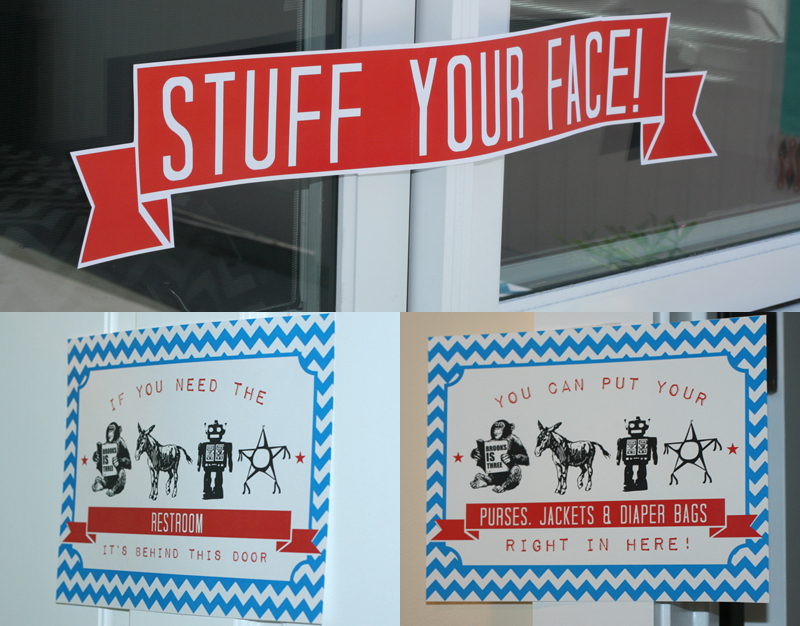 Here was the sign that greeted you as you walked through the door. My mom whipped up that flag with some extra fabric we had from the tablecloths. Isn’t it cute? (I’m trying to force her into business so if you’re in the market for a flag like this, email me! Although she might kill me for writing that! Oops!) 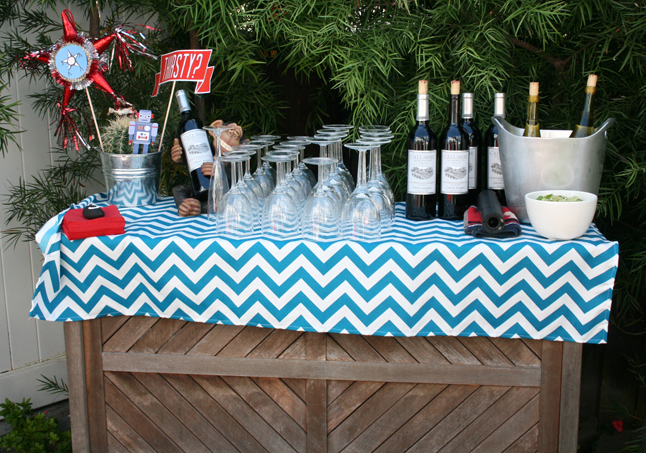 I ordered black and white chevron and blue and white chevron fabric from fabricguru.com for the party, and as you will see, we used the heck out of it. I honestly am at the point where zig zags make me want to throw up but if you’re seeing this for the first time, it might be pretty cute! 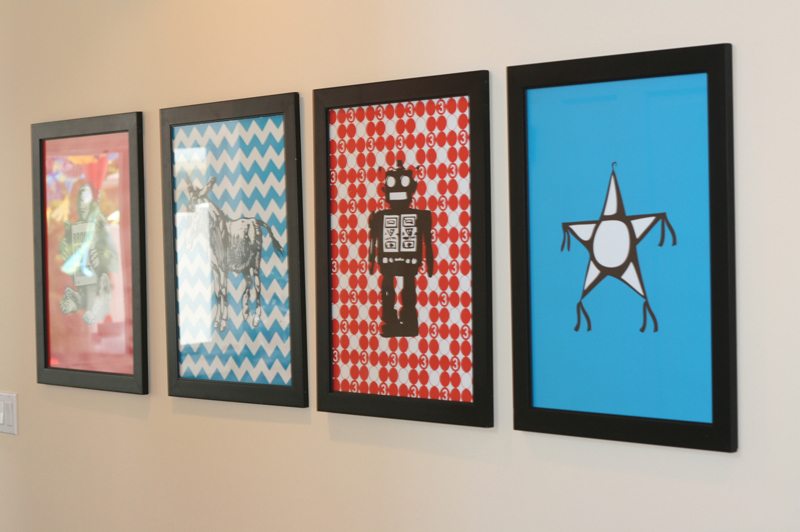 I had 18×24″ posters made of the monkey, donkey, robot and piñata (MDRP) for our hallway through a company called Vivyx. I had a coupon so they ended up being pretty cheap and the quality is incredible! Highly recommend these guys if you’re printing anything big. The photo above isn’t the best but I do like how you can see the reflection of the piñatas in the monkey poster. The cool thing is that these are the colors in my son’s room so I am going to hang one of them in there this week. Which to pick? Shoot out of the hallway and you’ll hit the living room. 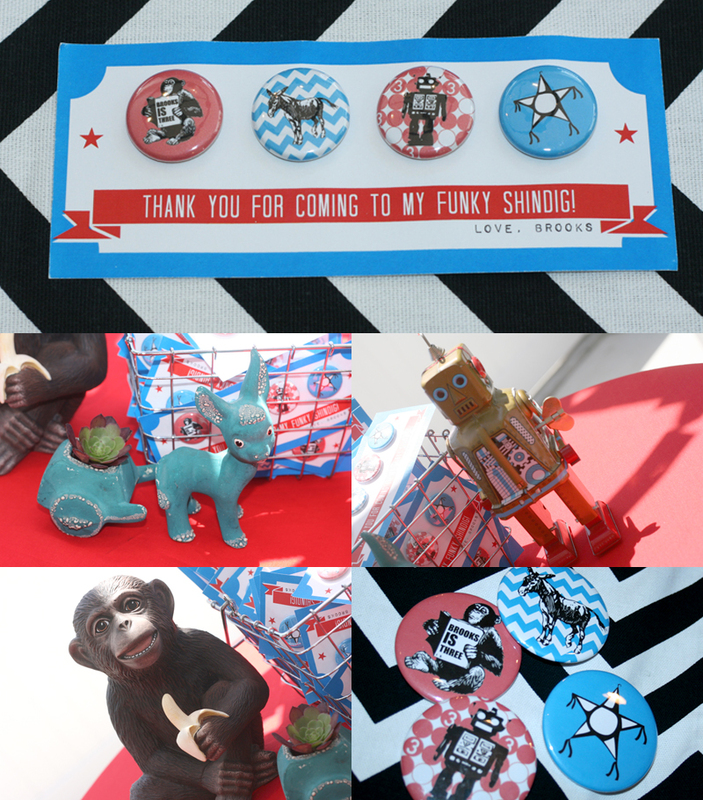 Once I decided to just go with this wacky theme, I got a little obsessed with searching for monkeys, donkeys and robots. I spent about 2 months looking for these suckers! I cannot even tell you how many “deals” I scored on ebay looking for these guys. And by deals, I mean that the robot may have been 99 cents, but the shipping was $15! Ridic and something I highly DO NOT recommend – but if you’re a nut like me, more power to you! Every day a new box would appear on my doorstep with another “treasure” inside. Such a hideous assortment of random ceramics I am now a proud owner of! Oh my goodness, ebay! You kill me! I love how some of these items smelled like smoke and I even got a donkey with a stronger, perhaps greener, smell surrounding it. Oh well! 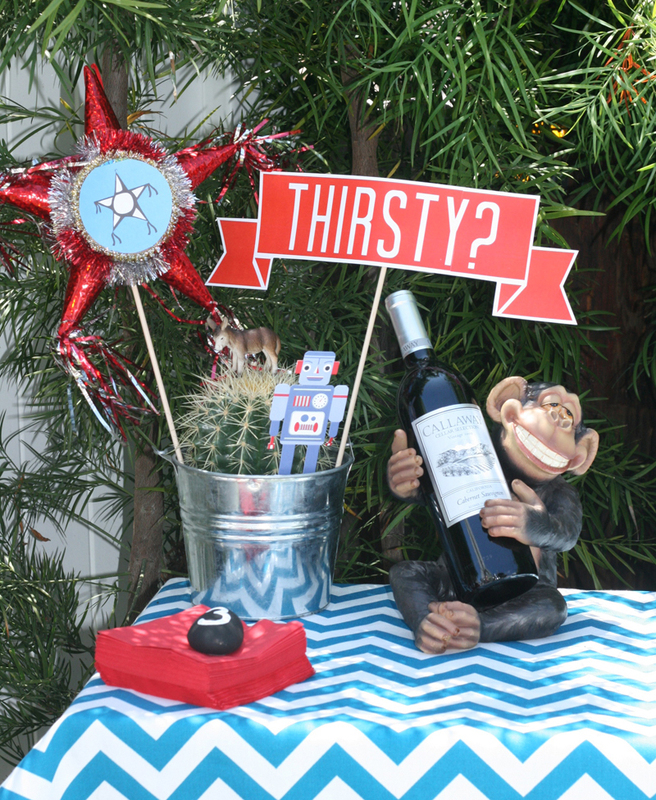 Can’t let a smelly donkey get you down when you have a party vision! And let’s just talk about these guys for a second, shall we? 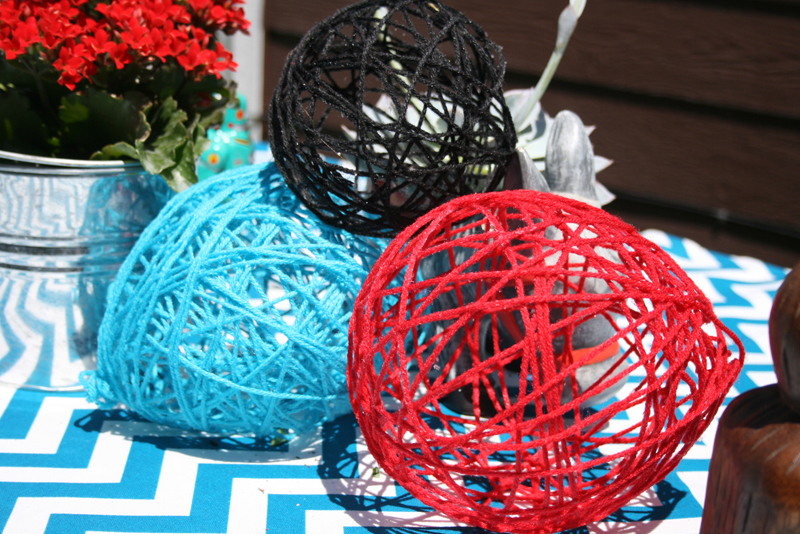 Yarn balls. You come to every party on the blogosphere these days and you look so dang cute, and you seem so fun, and you appear to be so easy to make. Um… nope. 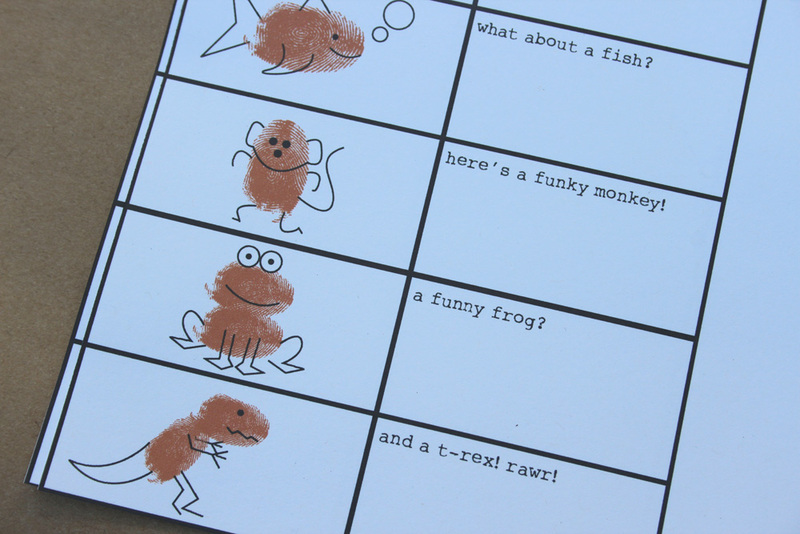 I’d rather hunt for monkeys and donkeys than make another batch of these guys! My 80-year-old, very grumpy, ex-marine neighbor calls his wife and his dog the same name: Pita. I shall call yarn balls this name as well. He says it stands for “Pain In The …” You get the picture. I tried about 4 different yarn ball recipes and ended up with sticky hands, sticky children, sticky floors, and a bunch of popped balloons and wet yarn. I finally found a way that worked for me best, but there is a reason these things are on the table and not hanging from the ceiling. Mine turned out so delicate and not stiff at all, so while they looked great, they were actually… well… a Pita. Okay… moving on. Let’s go outside to the piñata shop! 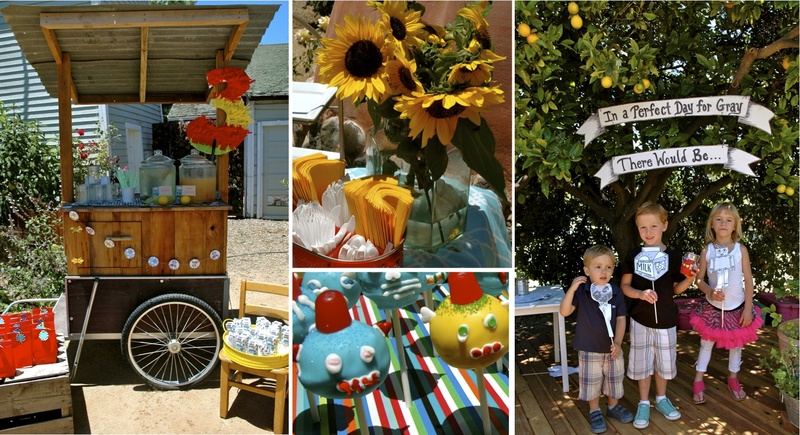 I was obsessed with turning our backyard into what I wanted to look like a piñata shop. I think it was accomplished thanks to my very fabulous, bilingual friend April whom I hoodwinked into taking a trip to Santa Ana with me to bargain for piñatas. She got me the best deal and I came away from our crazy trip with a car load of about 15 piñatas. Score! I wish I could tell you exactly where we got them, but I honestly don’t even think the store had a name. To keep things consistent, I covered the centers with wrapping paper to hide the Disney characters. 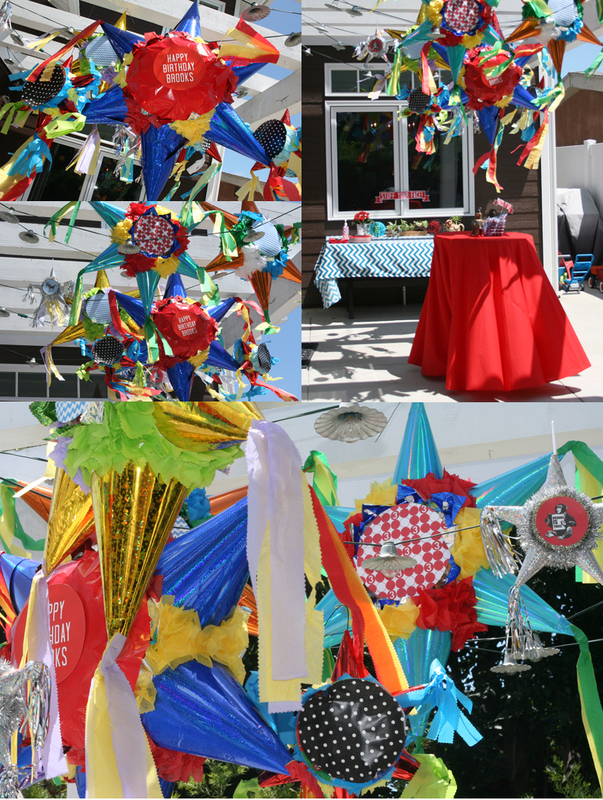 The smaller piñatas with the shiny streamers were from the 99 cent store! Another total score! 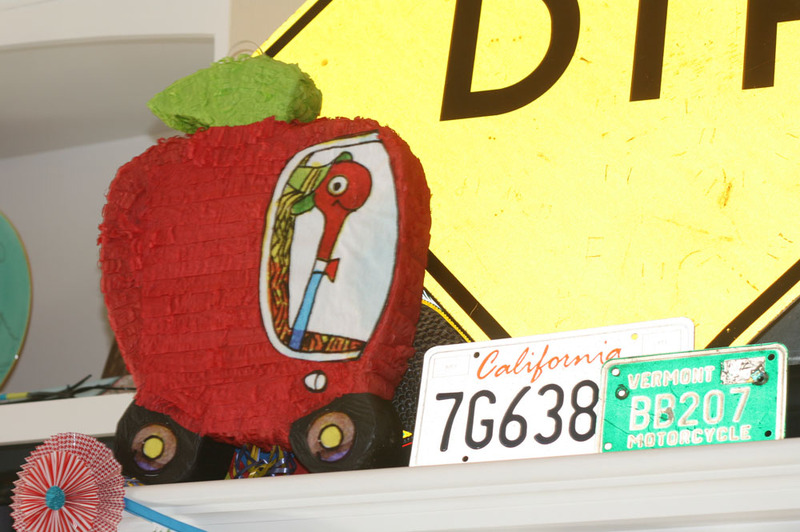 We filled the biggest piñata with candy… but we’ll get to that part of the party later this week. 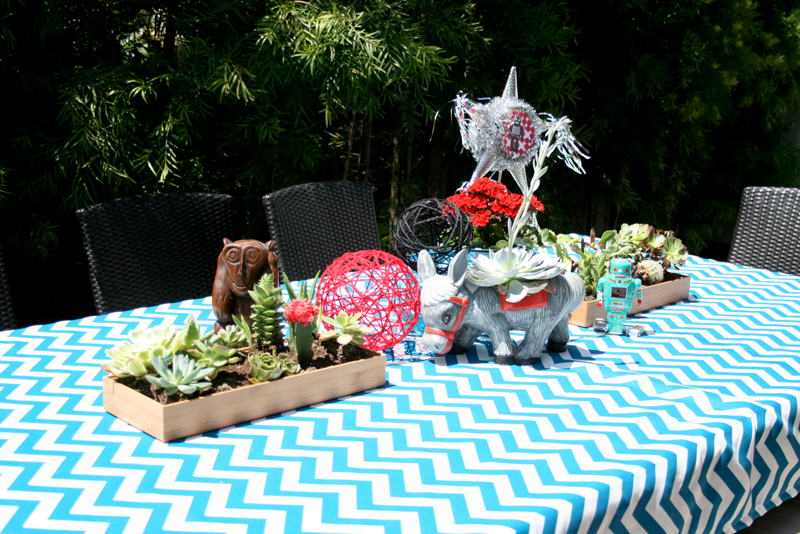 The tables were a mash up of succulents in low boxes (boxes from the Container Store, succulents from the farmer’s market for $1 a piece. 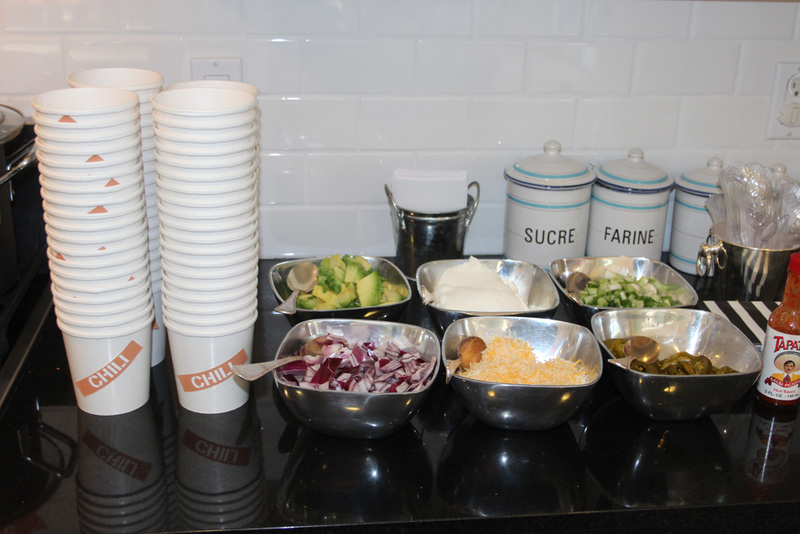 ), the “Pitas”, and of course, the MDRPs. 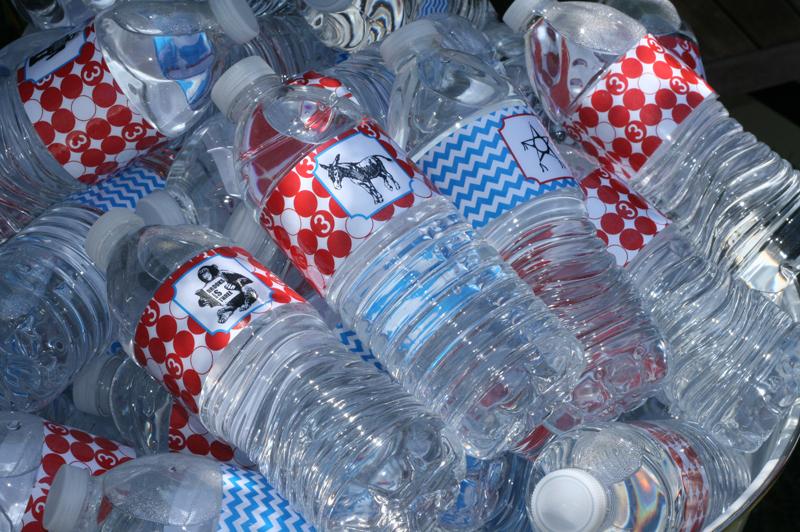 Are you thirsty yet? Because we had plenty to drink… …and a drunk monkey to boot! Or maybe water is more your speed. Belly up to the bar! I had signs everywhere bossing people around. 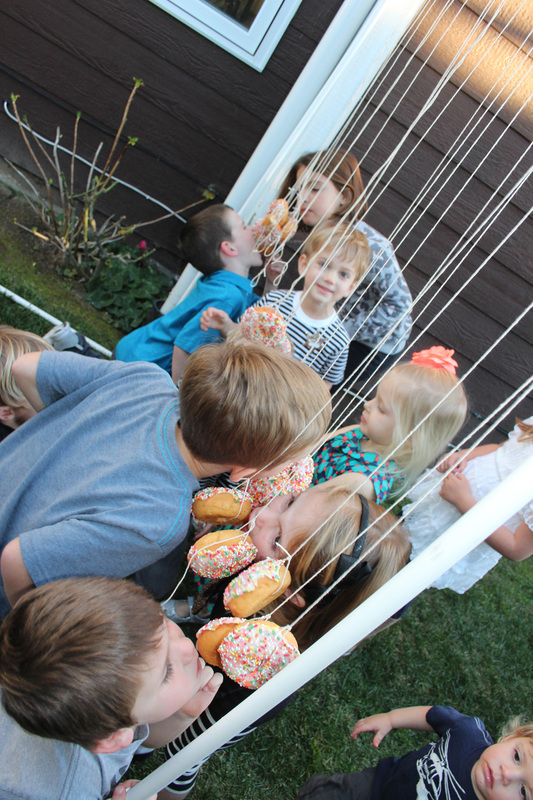 Anyway, let’s start buttoning up this post… For favors, I figured the kiddos could just take their piñata stash home, but I also wanted to leave them with something a little more memorable. I sent files to the fabulous Peter at KJW Buttons on Etsy. He was such a pro, made these guys so fast, and has great prices so if you’re in the market for favors like this, you should absolutely work with him! 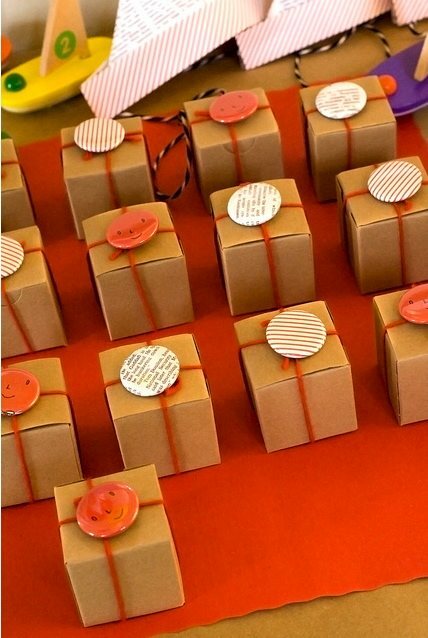 I had no idea if buttons would be a good kid party favor but they were a total hit. 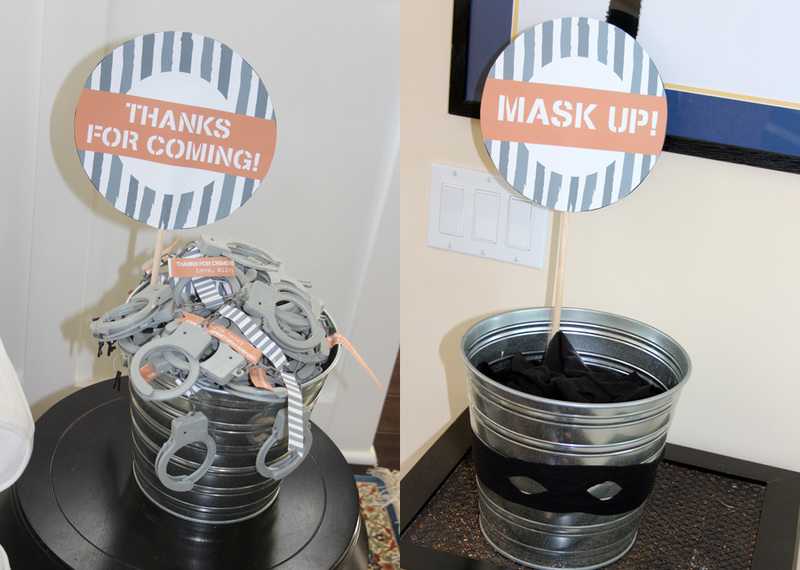 I put them outside where they were readily accessible and everyone – adults included – wore them throughout the night. Out of 50 sets, we only had 2 left over! It was so cute! Everyone got so creative. My mom even made earrings and a bracelet out of them. 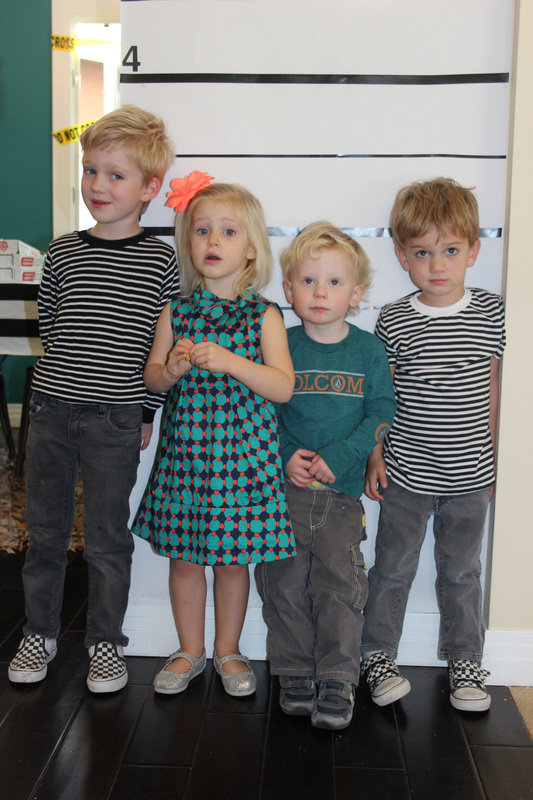 And look how cute they looked on the birthday boy! 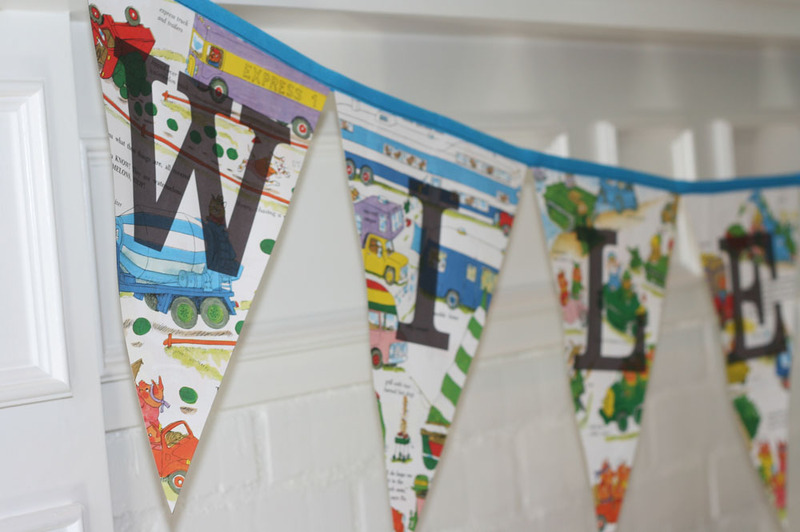 Okay – phew! I honestly cannot believe how much more there is to write about! I’m stopping for the day but come back tomorrow for more! 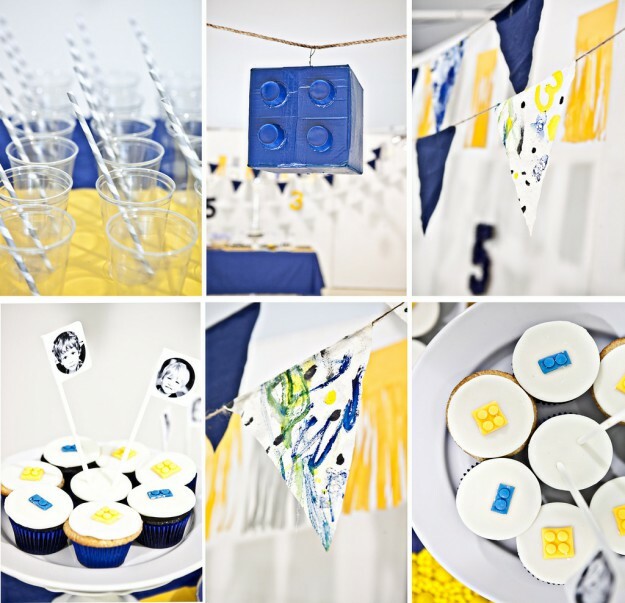 There is so much to love about this “Lego/Pirate” birthday party that Ashley of Not Without Salt threw her two sons. How about it’s apparent simplicity? I say “apparent” because what she put together for these boys is far from simple! But the total effect is clean, beautiful, and simply cool. 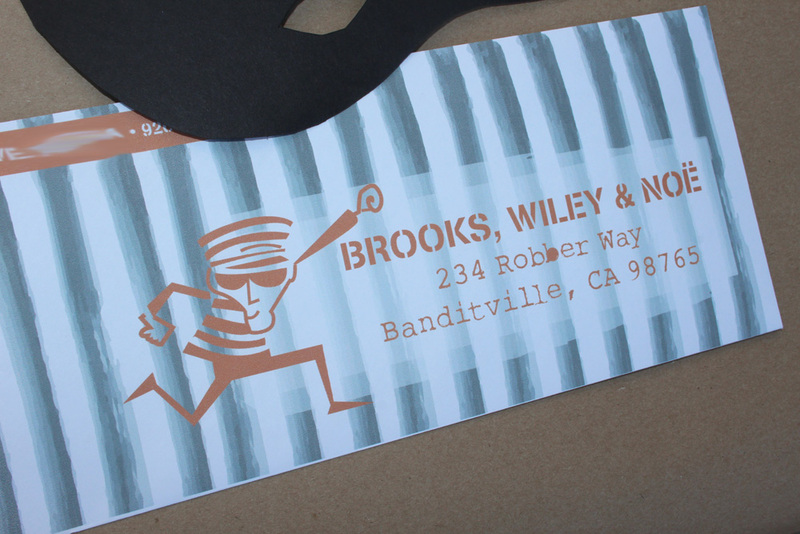 How about the simple two palate color scheme? How about the fact she made the lego pinata herself? 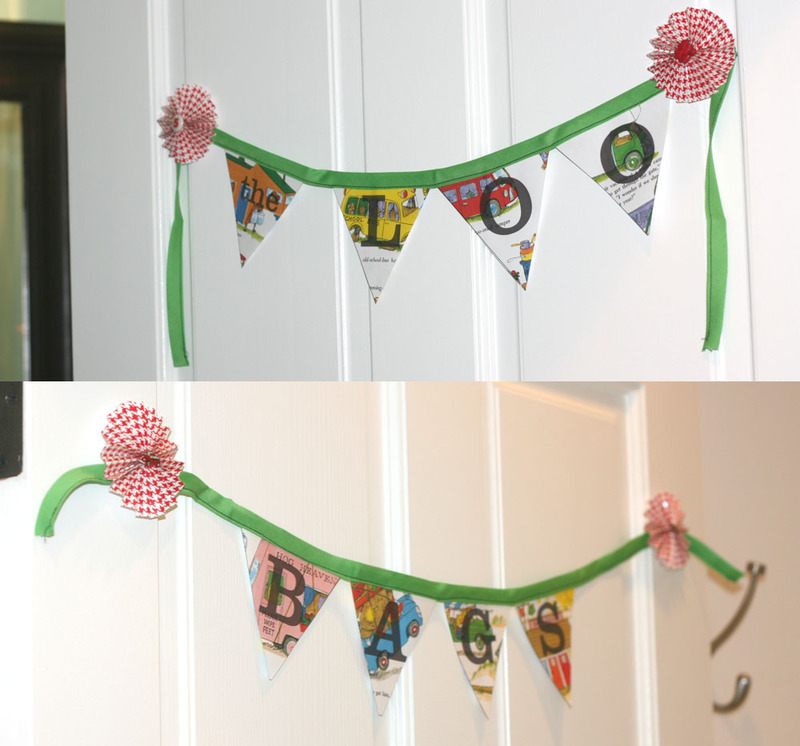 How about that she had the boys go bananas with paint on a dropcloth then stitched it up into bunting? How about how she took a lego/pirate theme and made it seem elegant? This party is just beyond words. I adore every detail. Oh, and did I forget to mention that Ashley is pretty much a famous chef and the food she served looked to die for? Yep. She’s that amazing. 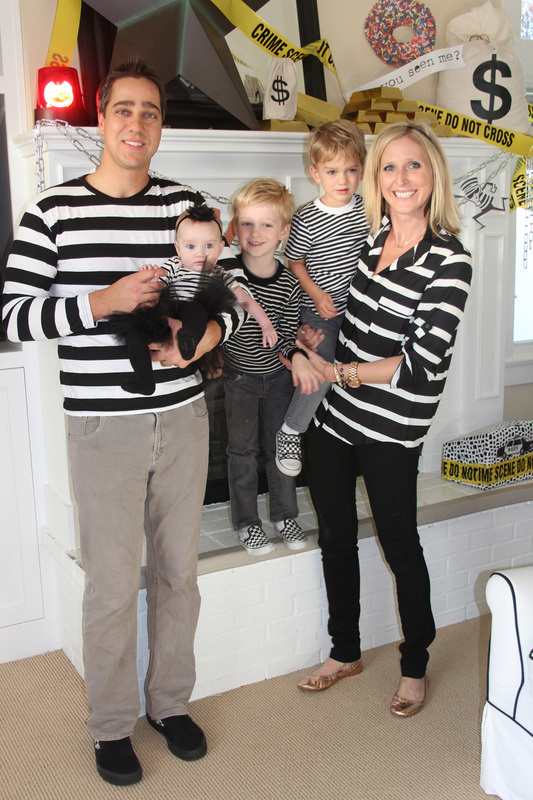 Head over to her blog to see what I am talking about. So much more eye candy for you there! 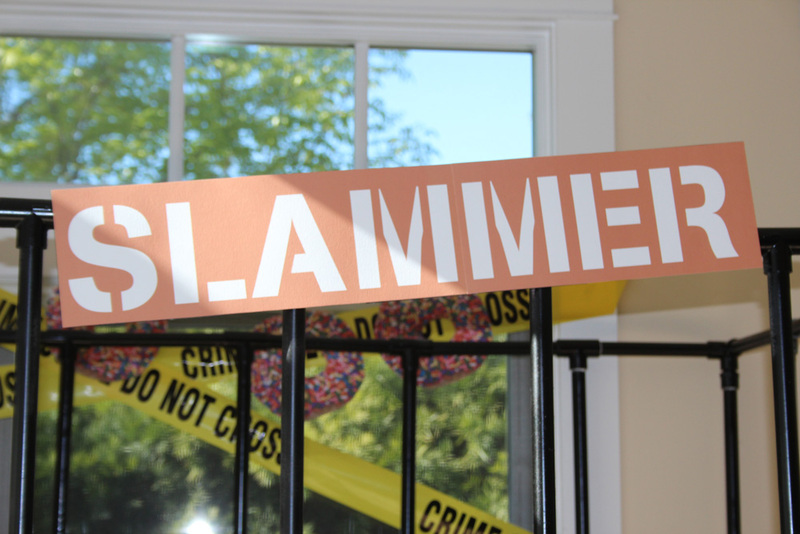 Ahhh… This was Not My Party but how I wish it were. 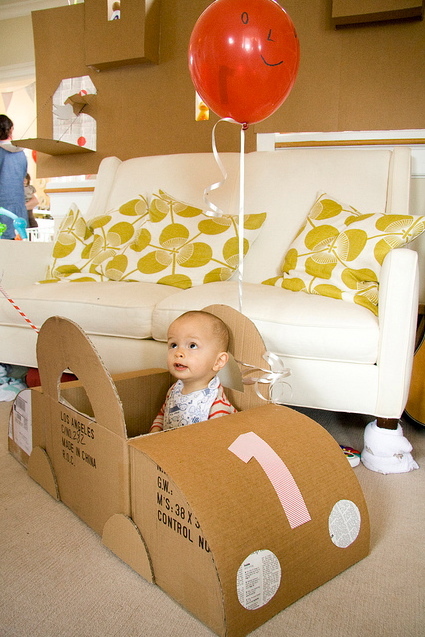 Talk about thinking outside of the box. 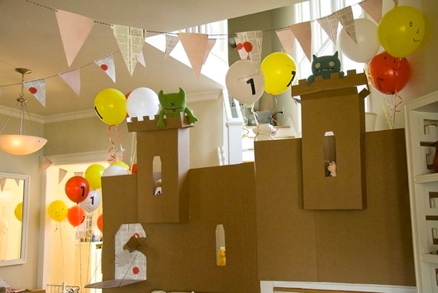 A cardboard box birthday party for twin boys. 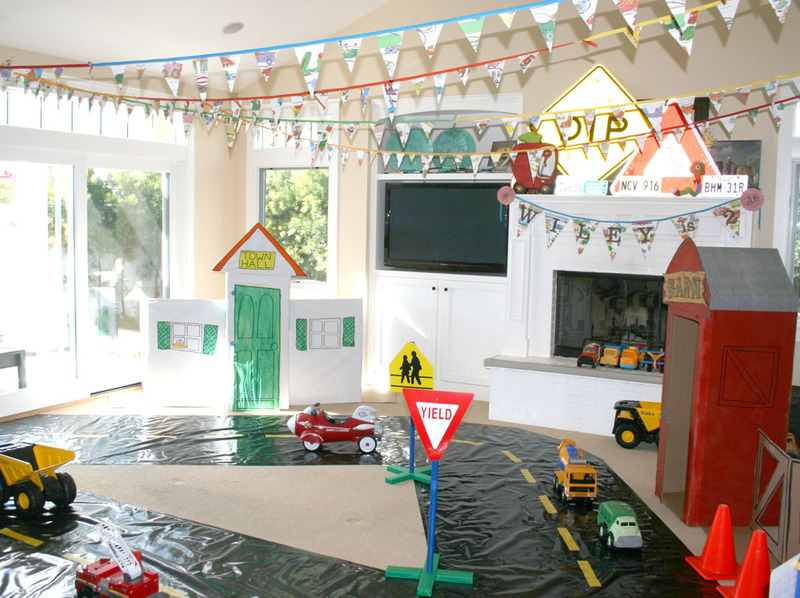 This has GOT to be the most creative theme I have seen for a birthday party. Can you imagine the toddler brain overload? 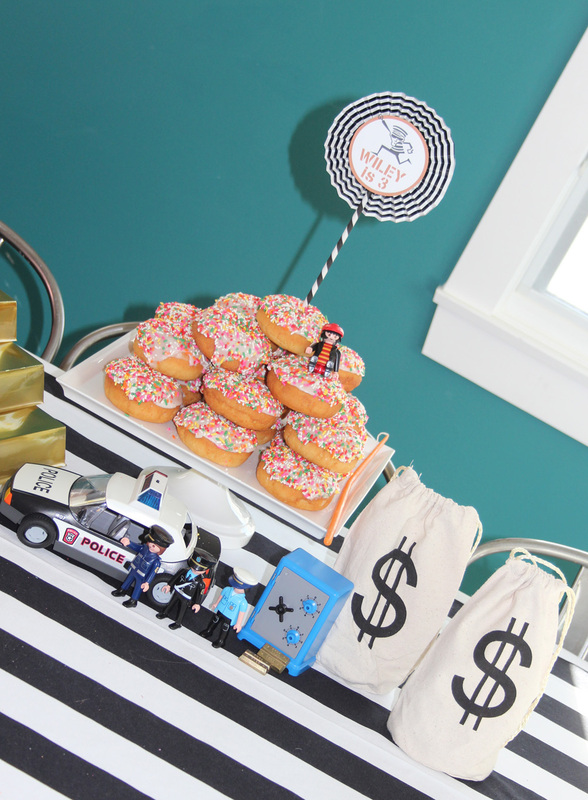 Kidlets would go bonkers for a birthday like this! I die! 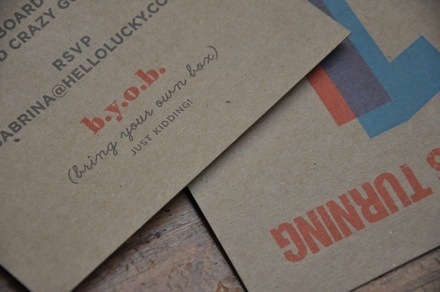 Of course something this incredible comes from the people at Hello Lucky. They’re the kind of creative peeps that make feel me sick inside because I know there is not a way on God’s green earth I will ever be as cool. I say this as a compliment to them. (Are you feeling sick too?) 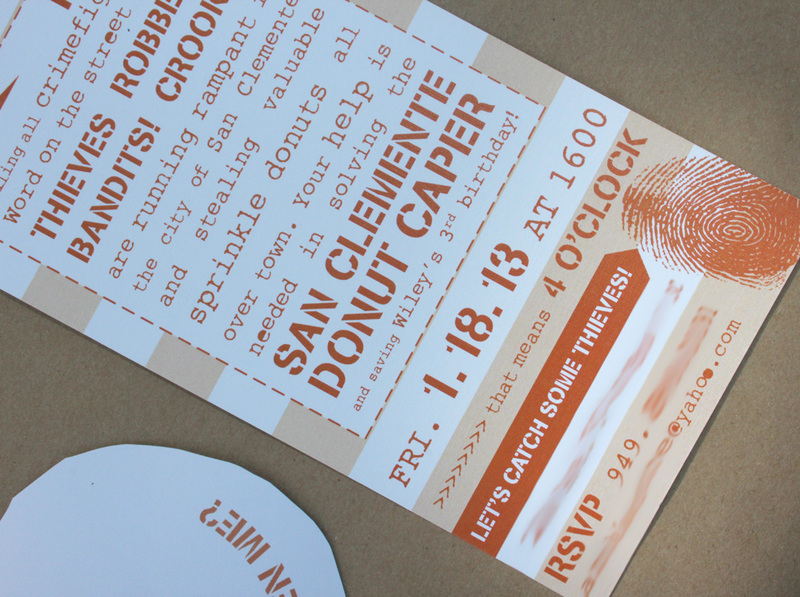 Looking at the details from this shindig makes me feel like I am getting slapped in the face with waterballoons of ideas. Ouch! And awesome! b.y.o.b! Bring your own box! Are you kidding me??? Too cool. And the hats! I am obsessing over that funny little balloon man that keeps popping up throughout the party. Funky and fabulous. I’m totally feeling inspired and depressed all at the same time! Even the boxes are insanely rad. 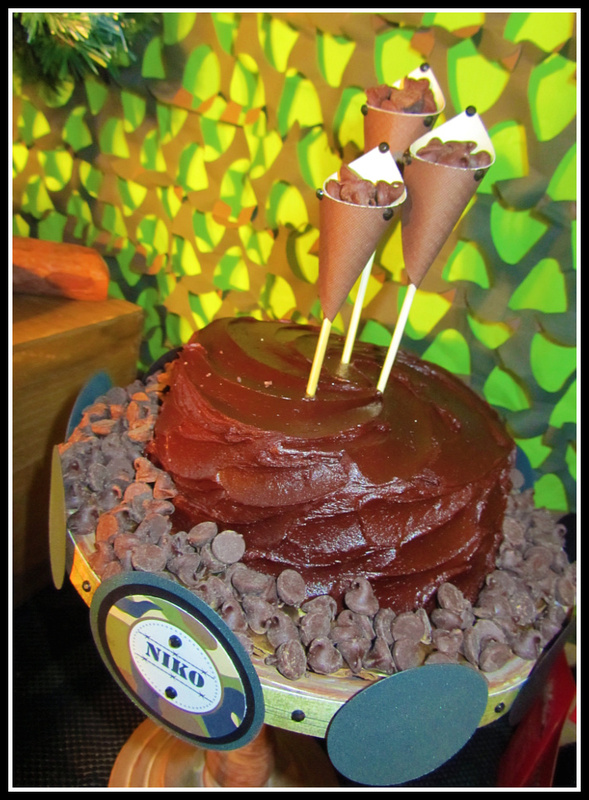 If you think you can stomach more awesomeness, check out the rest of the party here. One day I hope to reincarnated with a brain like the Hello Lucky-ers. Fantastic. 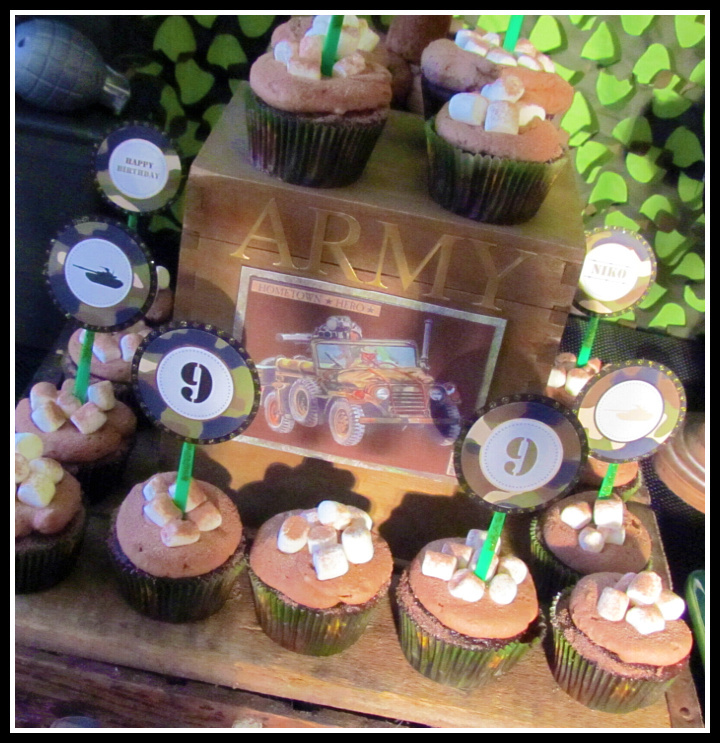 Well send me to the boot camp on how to make a party this cool! 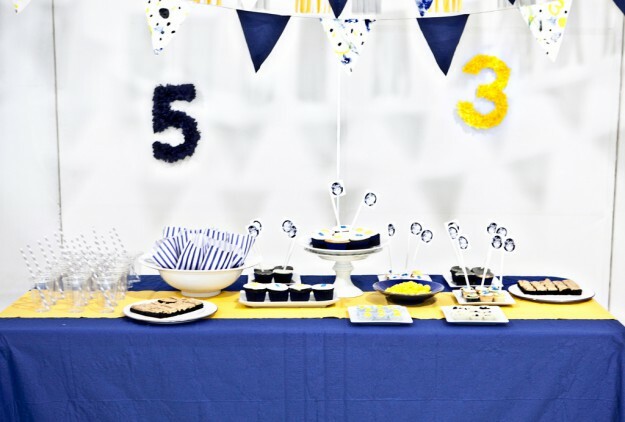 What an awesome and unique theme for a birthday boy! 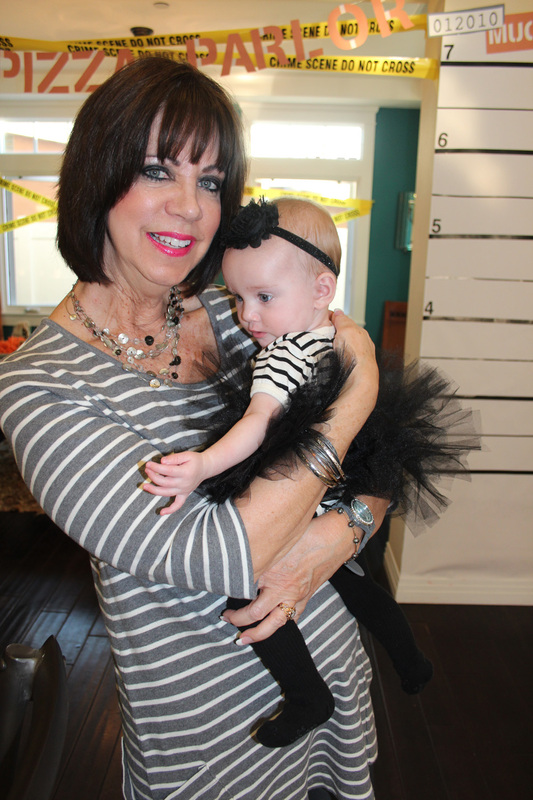 Genevieve of Celebrate Today… The Superchick Way sure was a superchick when she planned this beautifully detailed party for her 9-year-old son. Those bullets? Totally real (but old!) Holy amazingness! What a legit party! Hot chocolate cupcakes? How do you even think of something that cute? 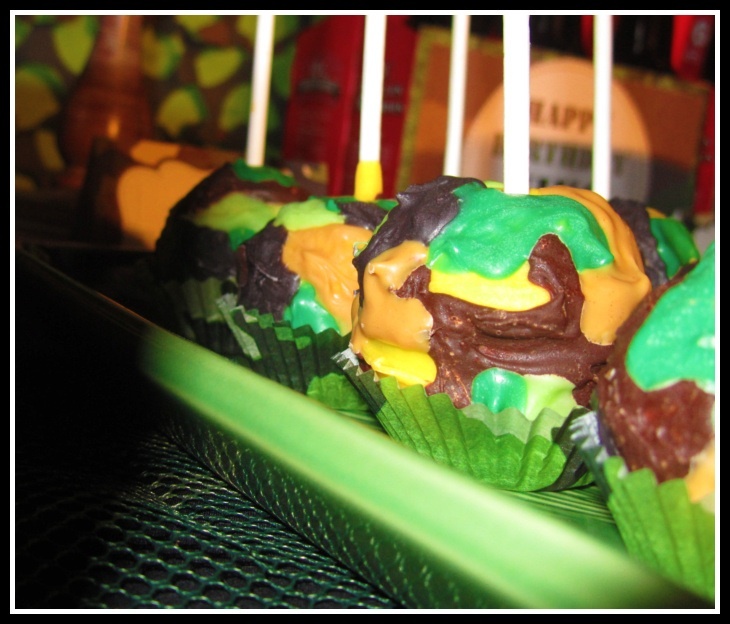 She even made camouflage cake pops. Can you see them? I don’t even want to know how long something like this takes! But totally worth every second! WOWZA! Isn’t everything just amazing? Well, that’s not all… This was only “Part 1!” Part 2 will delight you even more! 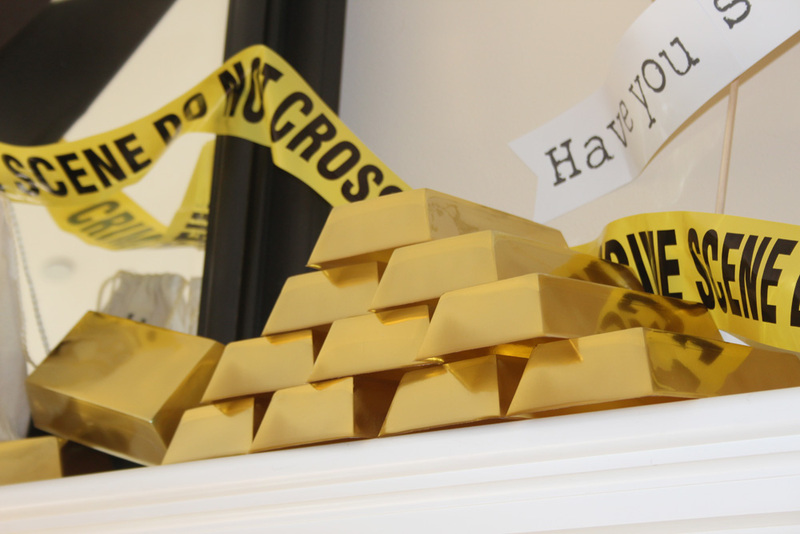 Make sure to check out her blog and see what insanely creative things she came up with! I know so many young men a party like this would be just fabulous for!